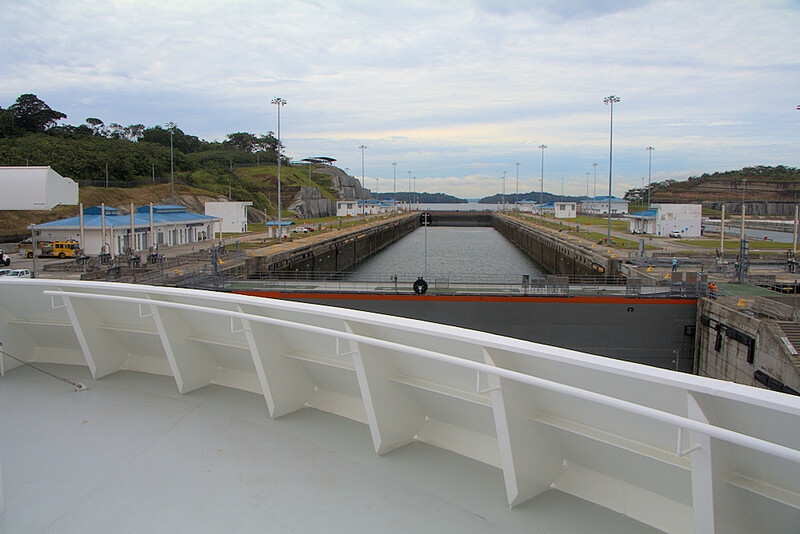 went through the Panama Canal for the very first time. It was one of the best cruise ships we've ever been on! 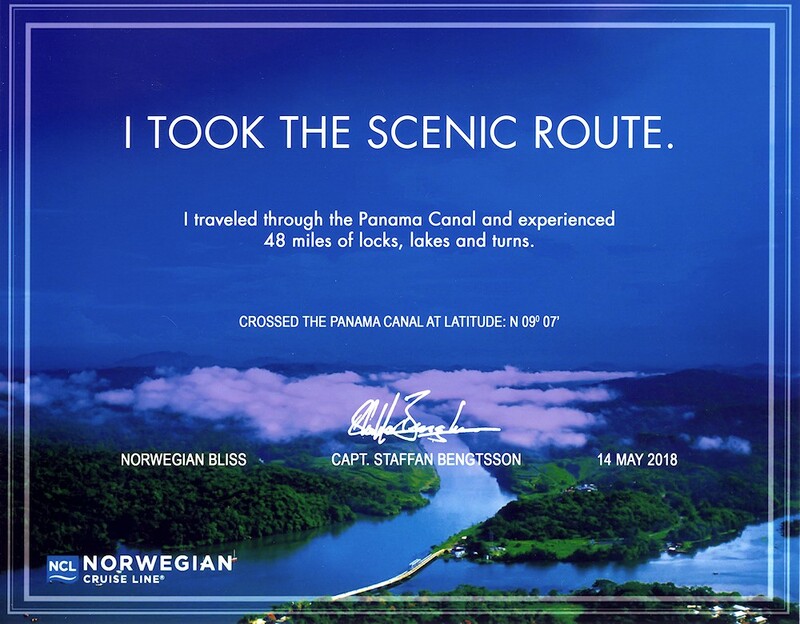 We had a FANTASTIC time on the Norwegian Bliss during our May 2018 cruise through the Panama canal. This really is one of the best cruise ships in the world, and one you should definitely be sure to cruise on. While I was onboard, I shot a lot of video as well as quite a few still photos. I'll share the best of them with you here on this page. I hope you're not in a rush... because it's going to take some time for you to get through all this material! 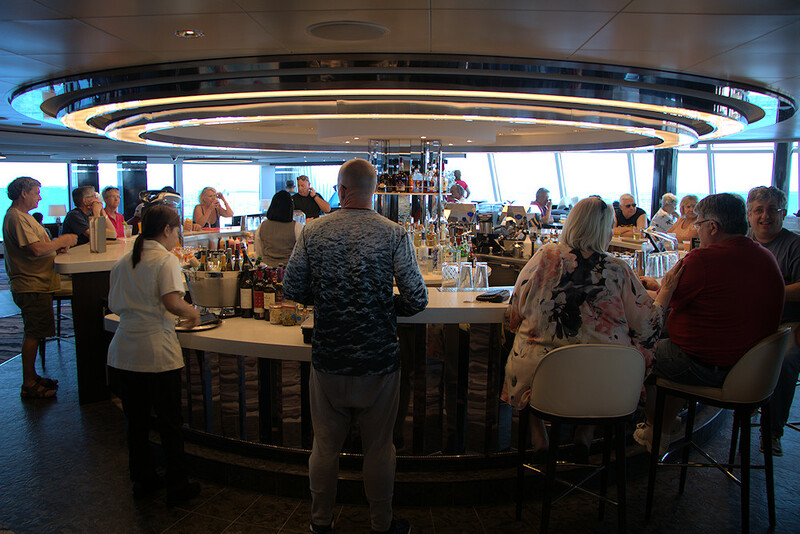 As I mentioned in the video, the Observation Lounge is one of the best new features that they added to this ship, compared to previous Norwegian Cruise Line ships. It's gigantic... taking up a large area of deck 15, directly above the ship's navigation bridge. 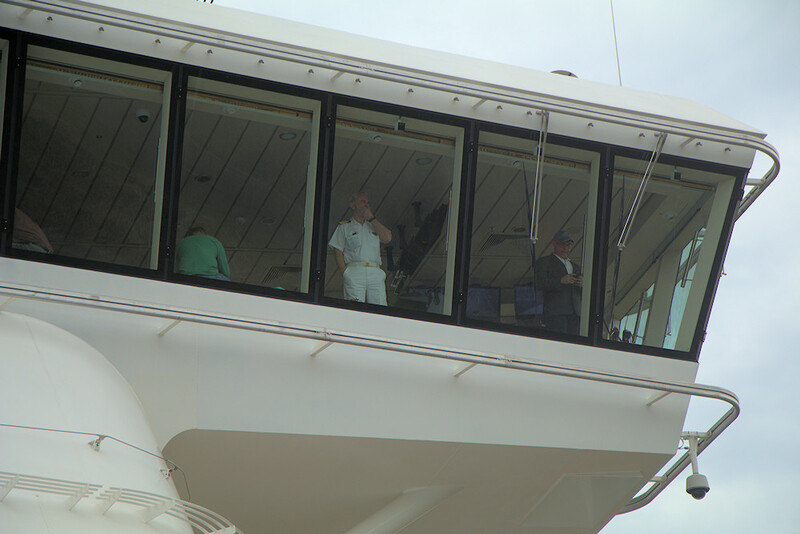 In other words, from the observation lounge, your view will be as good as the Captain's view! To really appreciate how large the observation lounge is, download the ship's deck plans. Here are a few still photos I shot of the observation lounge, to show a few additional details that you wouldn't get from the video. My favorite place to sit in the observation lounge was on this big circular couch located in one of the front corners of the room. This offers a great view ahead of the ship, as well as off to the left side. That's my wife, Kellyn, sitting on the big couch. We both really loved spending time in the observation lounge, enjoying the views without having to deal with the heat or the wind outside. We were very lucky to have booked a stateroom on deck 15, so that it was just an easy walk down the hall to get from our cabin to the observation lounge. If you're going to book a cruise on Norwegian Bliss, my strong advice to you would be to book a cabin that's near the forward end of the ship, so you can easily get to the observation lounge... and, if possible, book a cabin on deck 15, so you can get to it without having to climb any stairs. However, the one downside to having a cabin on deck 15 is that you will occasionally hear some noise through your ceiling, from the pool deck up above you. 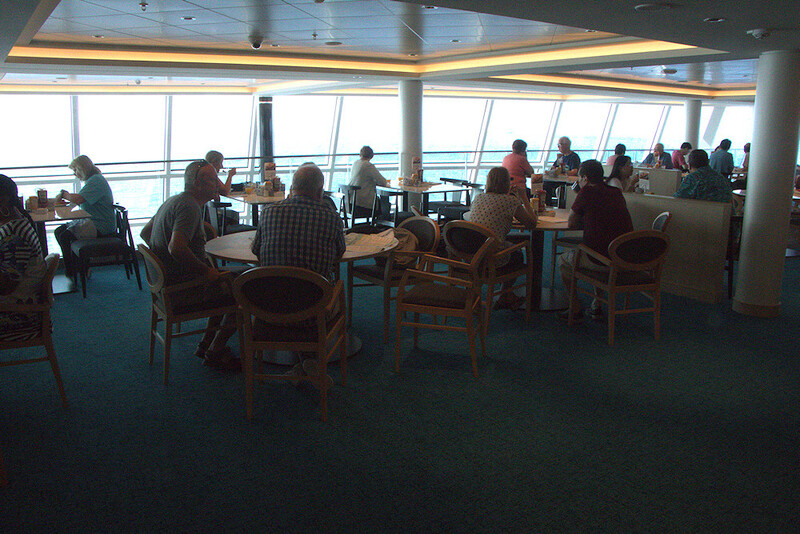 Another really great thing about the observation lounge is that they have a really good bar there. If you've sailed with NCL before, you probably know that they almost always run a deal where you can pick a special perk, or sometimes two, when you book your cruise... and the most popular perk is the beverage package that provides free drinks at the bars for the entire cruise. If you're going to hang out in the observation lounge and enjoy the view, it's especially nice to be able to enjoy your beverage of choice while you're there. 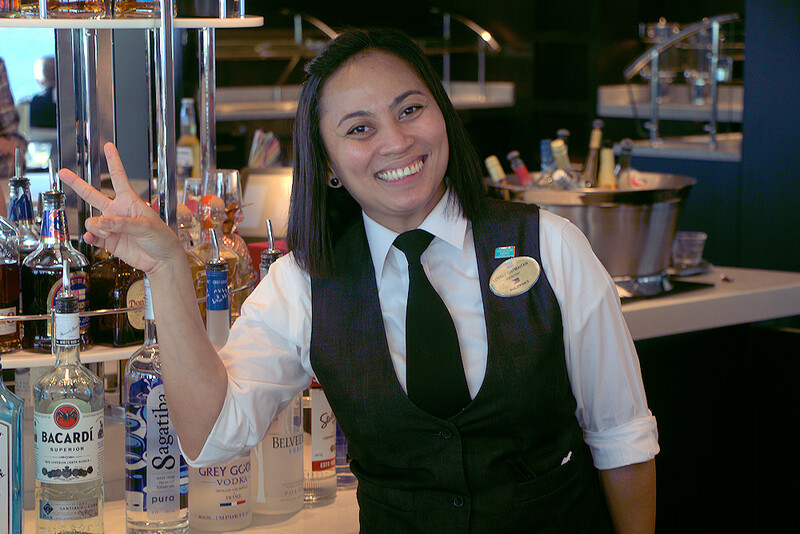 Since we spent a lot of time in the observation lounge during our 15-day cruise, we developed a preference for one particular bartender who always treated us especially well. Her name is Lovely Gatmaitan, and she is from the Philippines. Even though Lovely served LOTS of passengers, she was good about remembering our names and even our favorite drinks. Since I pretty much always ordered a Malibu and Diet Coke every time I sat down at her bar, she eventually just knew that was what I wanted... and just started making one when I sat down. They also have food in the observation lounge! 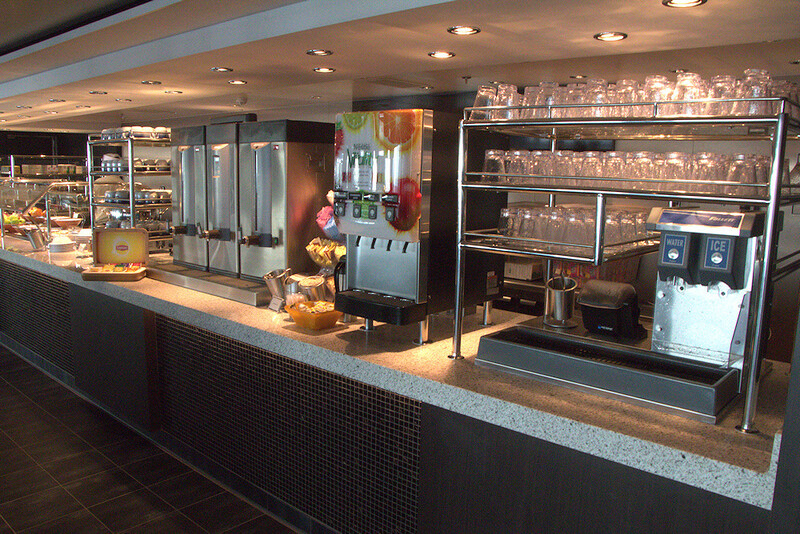 In fact, the observation lounge is so big that they actually have three different food stations in three different parts of the lounge. In this photo, you can see some of the food that they put out at breakfast time. So, it's basically a continental breakfast. If you want something more substantial than that, just take the stairs up one floor to the Garden Cafe, which is the ship's buffet restaurant, located directly above the observation lounge. They also serve a light lunch, and a light dinner here. I really liked the furniture that they chose for the observation lounge. There was a big variety of seating choices... everything from couches to chairs to daybeds, plus some tables for eating meals. The little daybeds in this next photo were especially comfortable. I wish I had one at home! And wow, what a view they had out those big picture windows! There were also two televisions on each side of the observation lounge, usually tuned to sports. Notice the table and chairs on the left, which are a great place to eat if you take advantage of the food they offer in the observation lounge, or if you bring down a big meal from the buffet restaurant one floor above. In fact, the seating upstairs at the buffet restaurant was not quite up to the task of handling 3,800 passengers... and there were several times we couldn't find an empty table up there and had to bring our meals down here. So, it was really good they had put some dining tables in here. 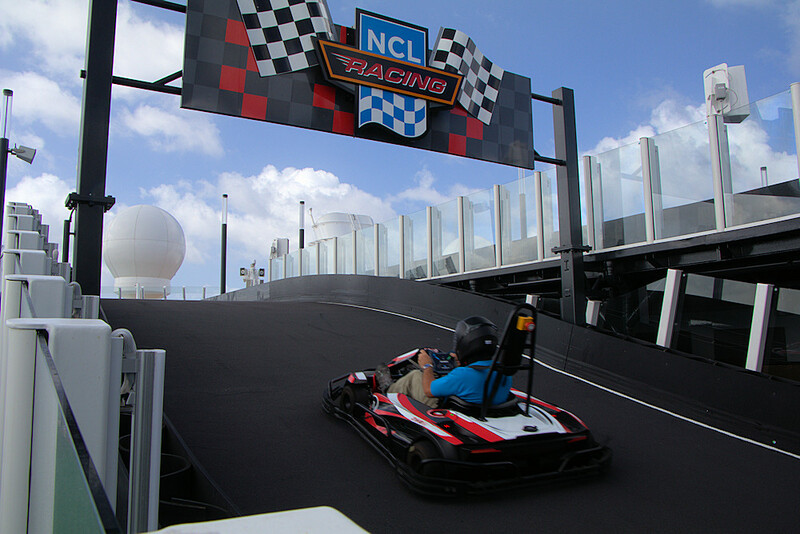 Another marquee feature on Norwegian Bliss -- something I've never seen on any other cruise ship -- is a go-kart racetrack. It was an awful lot of fun, and I rode on it numerous times during our 15-day cruise. I didn't shoot many still photos of the go-karts, because they are much better captured in a video. 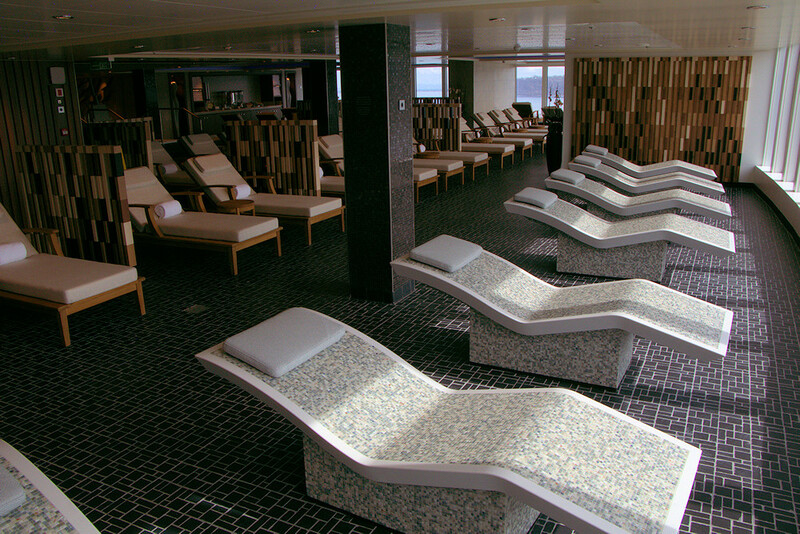 For more than fifteen years now, NCL has been including fantastic spas on their ships. I don't ever pay cruise ship prices for massages on a vacation, but what I really like about the spas on NCL ships is the Thermal Suite... a little slice of paradise whose centerpiece is a big indoor pool with water as warm as in a Jacuzzi. I got some nasty comments on YouTube about the title of that video! Some people felt tricked in to watching the video, thinking I was going to reveal some horrible design flaw about the balcony cabins on Norwegian Bliss... which is exactly what I intended when I named that video. I just didn't count on the fact that not everyone understands my sense of humor! I saw Casey Neistat wear one in one of his videos once, and I thought it was funny and ordered one for myself. I wasn't exactly sure what I was going to do with it, but I figured that someday it might come in handy as some kind of joke in one of my YouTube videos. It sat and sat in my closet until after I got home from my Norwegian Bliss cruise, and I got the idea to use the clickbait idea as a funny way to approach a video about the cabin that we chose for our cruise. If you are interested in booking a spa cabin on Norwegian Bliss, be aware that there are three kinds to choose from. The least expensive spa cabins are known as "spa balcony" staterooms. These have the identical floor plan as all the regular balcony staterooms on the ship, but you get full access to the thermal suite in the spa. However, I would encourage you to instead consider a "spa mini-suite with balcony". These staterooms are just a little bit bigger than standard balcony cabins, but have a much nicer bathroom and shower. I really prefer the bathroom and shower in the mini suites over those of the regular cabins... especially due to the fact that the shower is so much larger that two people can actually share it. The most expensive type of spa cabin is a "Haven Spa Suite". We've stayed in Haven Spa Suites on the Norwegian Escape and the Norwegian Getaway, and they're really great! You have full access to The Haven, the V.I.P. area of the ship that offers a pampered, luxury experience for affluent travelers willing to pay two or three times the price of a regular cruise fare. 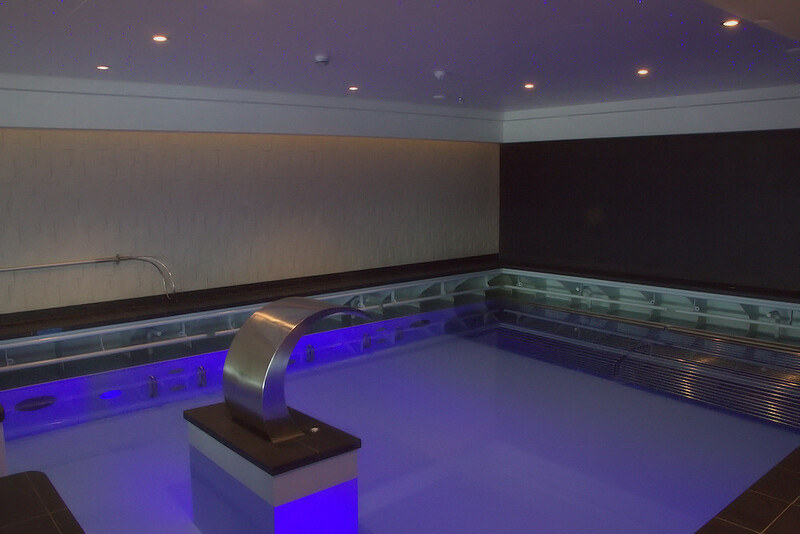 Of course, because these are spa suites, you also have access to the thermal suite in the spa. You also have the services of a butler and a concierge. And each Haven Spa Suite has a private Jacuzzi tub, for the ultimate romantic experience. I'm not talking about a Jacuzzi tub in the bathroom... I'm talking about having one right inside the main cabin, next to the bed. If that sounds interesting to you, check out this page where I talk about our cruise on Norwegian Escape, in a Haven Spa Suite. Something very important to know about the Haven Spa Suites on Norwegian Bliss is that they are MUCH larger than the ones on Norwegian Escape and the other ships in the fleet. I would have definitely booked us in to one of these big Haven Spa Suites on Norwegian Bliss, except on this 15-day Panama canal cruise, the prices were just too high. You always pay a lot more to cruise on a brand new ship, and then when you factor in the fact that this was a 15-day cruise rather than a 7-day cruise... prices for Haven Spa Suites were just out of reach for me. 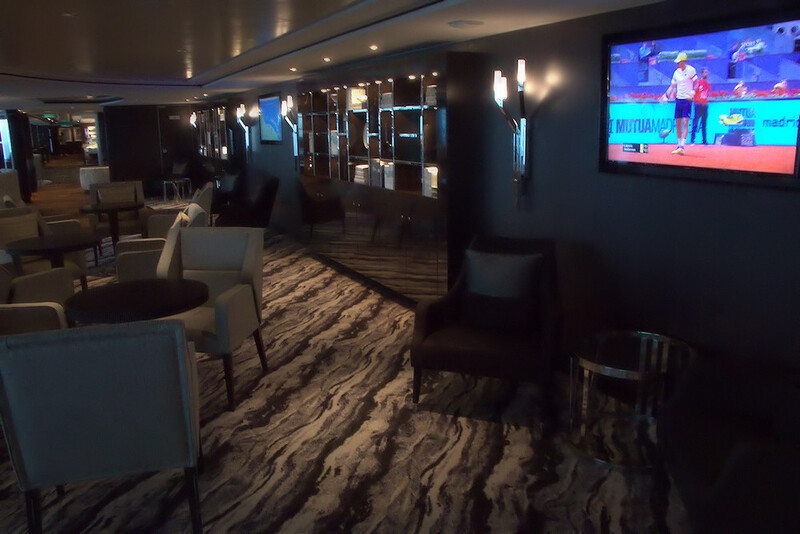 The Haven lounge is now at the very front of the ship, with spectacular views similar to those in the Observation Lounge. On the previous generation of ships, it was in the interior of the ship, with no view. 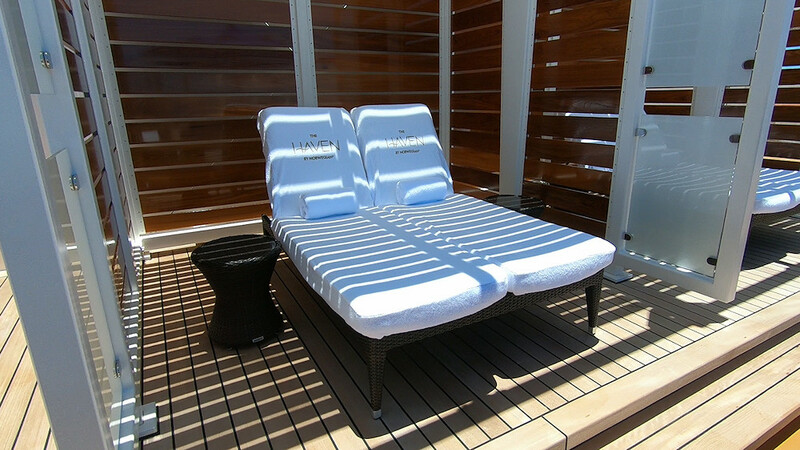 The Haven Sun Deck has been expanded in size, to offer even more places to relax outside. There is a row of bar stools at the very front of The Haven Sun Deck that have amazing views ahead of the ship. There are more daybeds on the second level of The Haven courtyard. There are more umbrellas on The Haven Sun Deck, to provide more shaded places to relax. There are two Jacuzzis on The Haven Sun Deck instead of just one. I find it interesting that Carnival was the first cruise line to add a vertical-drop water slide to one of their ships back in 2012. My mind was blown the first time I saw the Green Thunder waterslide on the Carnival Spirit! It was the scariest, most-fun thing I had ever experienced on a cruise ship... and I thought it was an absolutely brilliant move by Carnival to put such a fun feature on one of their ships. This is my most-watched YouTube video, with an incredible 94 million views! I just assumed that this was the direction that Carnival was going to take for the waterslides on all their new ships after that point. I assumed wrong! Carnival has never included a similar vertical-drop waterslide on any of their new ships since then, and took the two ships they had retrofitted with those slides and moved them to Australia. I think they missed a big opportunity for being known as the cruise line with the best waterslides. On one of the first days of the cruise, I noticed workers placing a bunch of boxes and equipment in a location near the go-kart racetrack. A few days later, I overheard another passenger say that workers had added a mini-golf course to the ship... something which hadn't existed when we first got onboard. I walked up to the top deck of the ship, and sure enough... there was a new mini-golf course in a spot that just a few days earlier had been empty! The Norwegian Bliss was a nearly perfect match for my tastes in food. 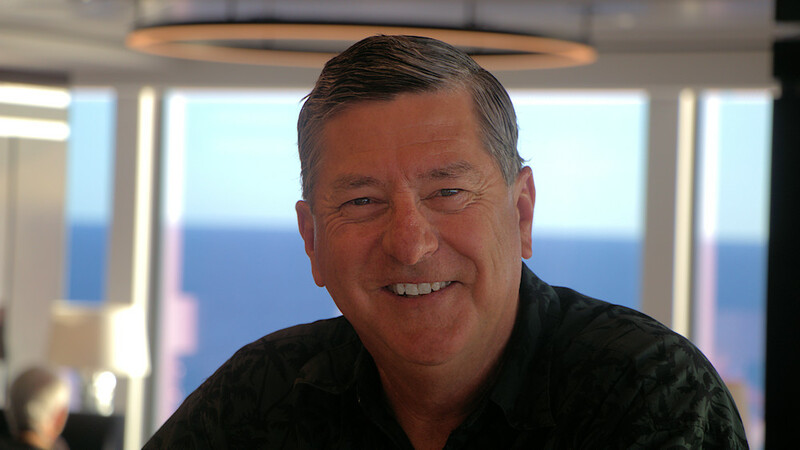 I was recently on a cruise where I disliked the food they served, and where I literally looked forward to the ports of call... just so I could get off the ship and have a decent meal at a restaurant on land. So it was quite a contrast to be on this ship, which offered exactly the kinds of food I like, and which kept me fat and happy for all 15 days. 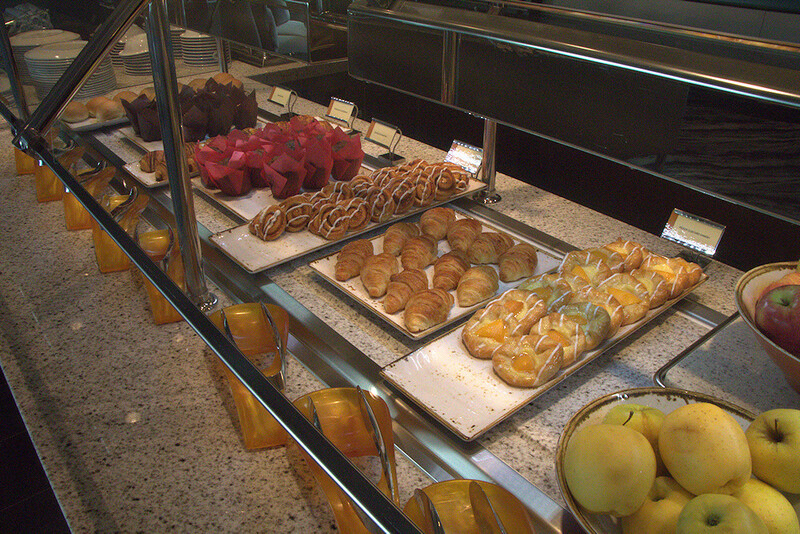 I've done 44 cruises, but never had a cruise ship breakfast that was quite this good! I've had these same basic breakfast items on just about every cruise, but they managed to make it especially delicious on Norwegian Bliss. 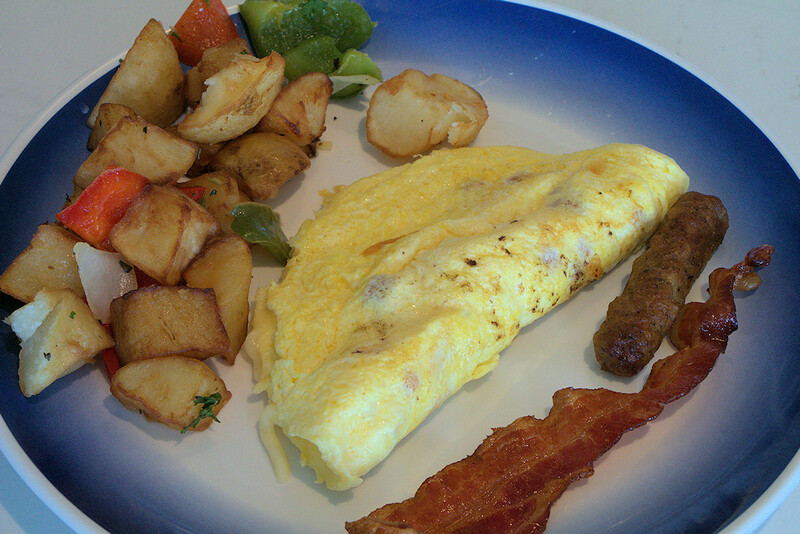 The omelet was perfectly cooked, a big contrast to the thin, overly-cooked omelets I got a few months earlier on the MSC Seaside. The potatoes were just perfectly prepared, and super flavorful. Carnival cruise line serves a similar type of breakfast potato in their buffets, but the Norwegian Bliss version was cooked a little more thoroughly, and somehow had better flavor. The bacon was perfectly crisp, as bacon should be... not limp like it is in some cruise ship buffets. 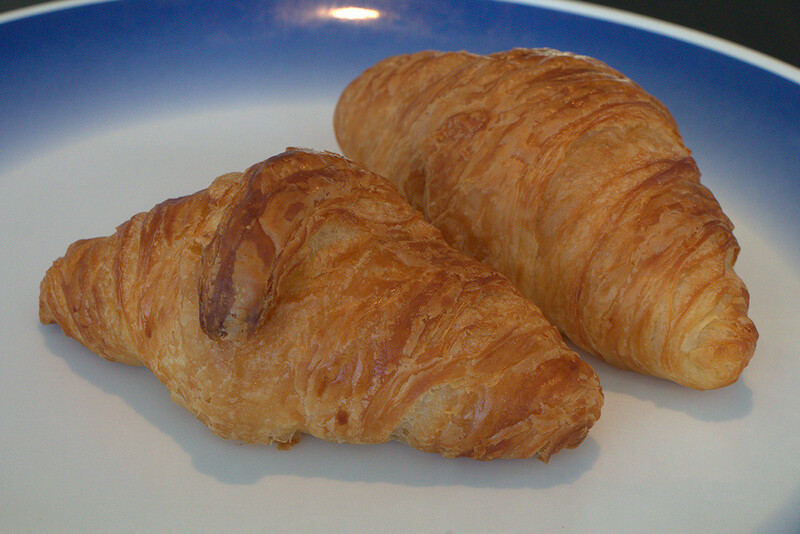 While I do have to admit that the croissants on Viking Star were better, these croissants on Norwegian Bliss were a solid 9 on a 10 scale. I liked the sausage, too. Another thing about the Garden Cafe on the Norwegian Bliss is that you just can't beat the view! The entire restaurant is lined with big picture windows, and if you sit up at the forward section, you'll have a view forward that is every bit as nice as the view in the observation lounge. In fact, they share the same view out the same windows. Before I say this next thing, I just want to emphasize how thoroughly delighted I was with the food in the Garden Cafe, especially the food they serve at breakfast. But now, I would like to point out a few areas for improvement. The worst thing about the Garden Cafe is that they have inadequate seating to handle the peak meal times. At dinner, there's plenty of seating, because so many passengers eat dinners in other dining venues. But at lunch and breakfast, this restaurant gets super-crowded. They actually have enough serving stations to handle the crowd quite well. The crowding wasn't at the serving stations, like it is on some other cruise ships. The problem was that there were simply not enough tables for everyone to sit at. 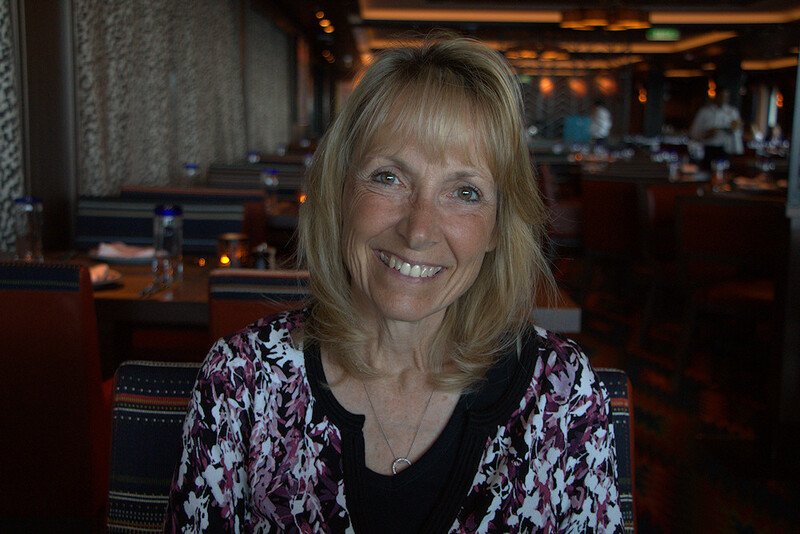 During our 15-day cruise, there were numerous times when we walked the entire restaurant and could not find one available table to sit at. This is really awkward when you are carrying a plate of food and you want to sit down and start eating it before it gets cold. We ended up having to either walk downstairs to the observation lounge and eat there, or having to go out by the pool and eat outdoors at the tables there. Neither one of those is a good option, because it's a long walk back to the serving stations if you want seconds, or if you forgot to get something the first time around. If you look in the forefront of that previous photo, you can actually see that there is empty floor space in certain parts of the Garden Cafe! In other words, there's room for a few more tables. They should immediately put some in. The one other suggestion I have for the Garden Cafe is that they need to offer Mexican food there at every lunch and dinner. They actually have a dedicated station in the buffet just for Indian food, and that's really a niche genre of food for a boatload of American tourists! There should be a Mexican food station in their buffet. Of course, the buffet is just a small piece of the overall Norwegian Bliss dining situation. The best food is found at the specialty dinner restaurants. Here's a look at what I ordered at Cagney's, which is the ship's American steakhouse. I loved my meal at Cagney's, especially the fact that we got to eat outside, on The Waterfront, with a fantastic view. It was a special meal, which I think I did a decent job of capturing in that first video on this page. 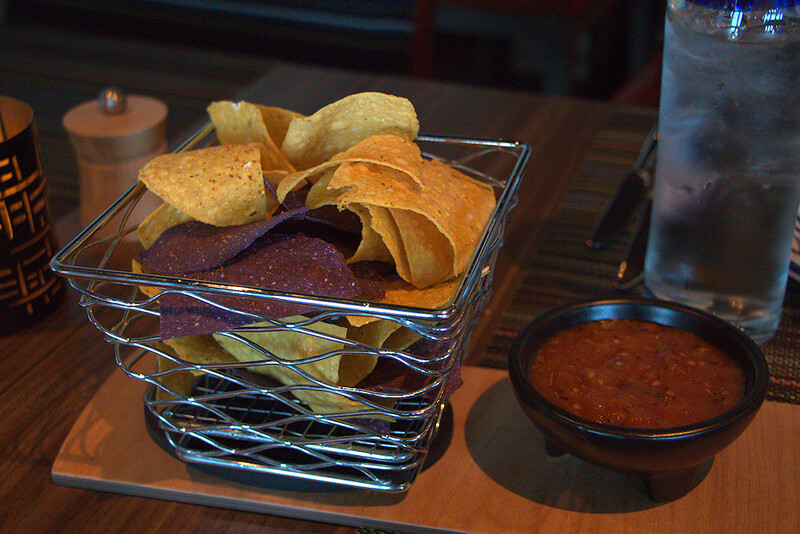 A new restaurant that I haven't experienced in my previous NCL cruises was Los Lobos, a Mexican restaurant. 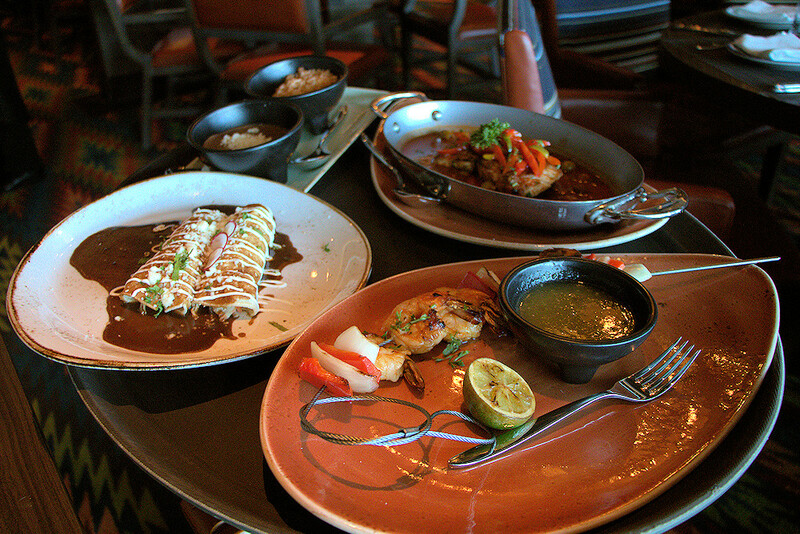 I was so happy to see they added a Mexican restaurant on this ship, and the food did not disappoint! 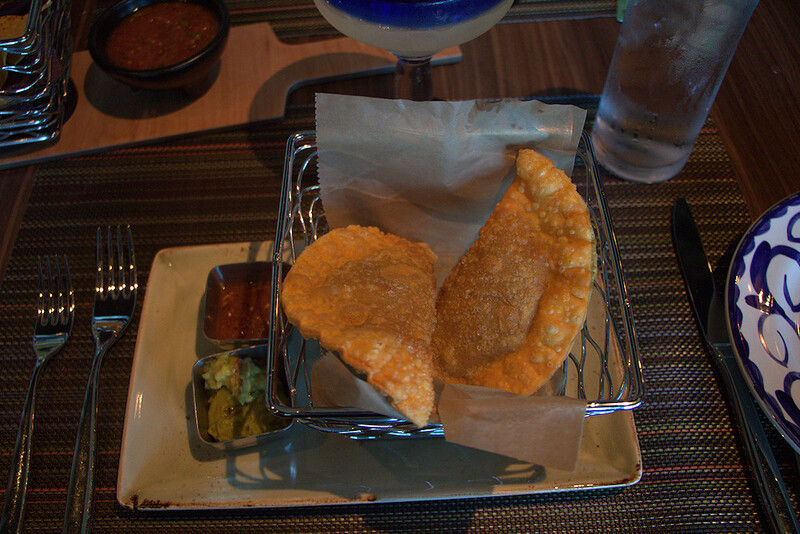 For an appetizer, I had the beef empanadas, and liked them a lot! 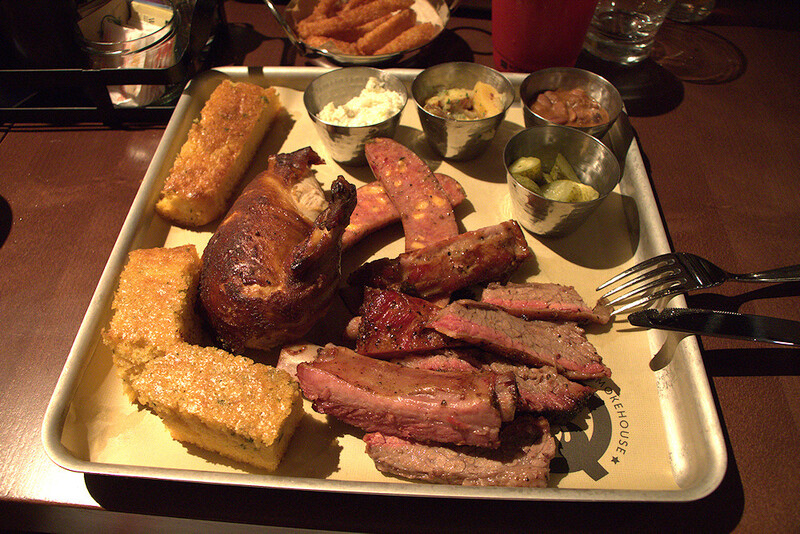 Another new specialty restaurant they had onboard was Q, a Texas-style smokehouse BBQ joint. I ordered the Pitmaster Platter, which was excellent. There was so much food that two people could probably have split it, but I kept it all to myself! The best item on the platter was the brisket. I think if I ever make it back to Q again, I'll just order the brisket by itself next time. Take a look at the full menu for Q here. The other two specialty restaurants that we visited during our cruise were the Italian restaurant, La Cucina... and Jimmy Buffett's Margaritaville. I failed to shoot photos of the food at either of those two places, although if you watched my video review of the cruise, you saw a few video clips there... including the famous Volcano Nachos at Margaritaville, which I definitely recommend! I was totally impressed with the entertainment on Norwegian Bliss. Having been on 44 cruises, I can tell when a cruise line is spending a ton of money on entertainment, and when they're doing things on the cheap. For example, are they paying real musicians to perform live on their ship during the big stage shows, or did they just record all the background tracks in a studio on land so that they wouldn't have to pay real musicians to be on the ship? If you look real carefully at this very busy photo I snapped at one of the shows, you can count 7 real live musicians playing behind three vocalists out front. That's ten people they had to pay, just to put on this one show. 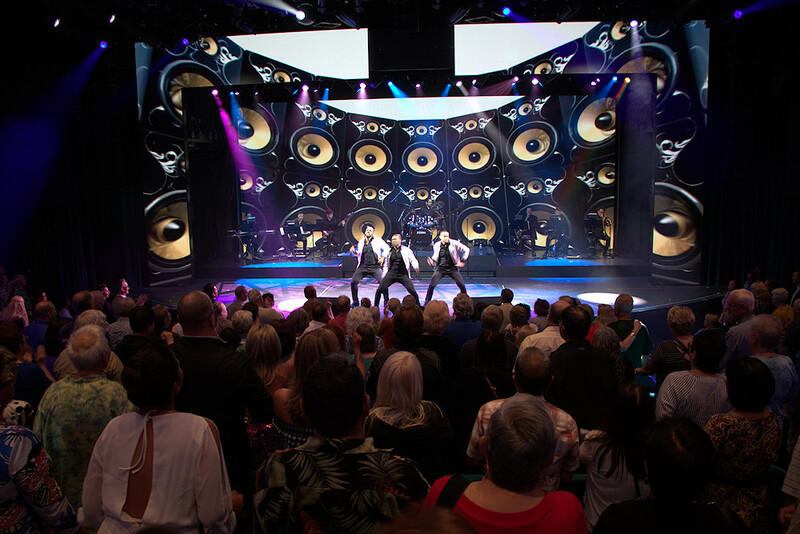 And this was just one of a huge number of musical acts that performed during our cruise. Norwegian spent some big bucks on the entertainment on Norwegian Bliss! The trio performing in that photo was called "Uptown", and they put on a really good show involving a lot of very well-known Motown and soul classics. It was very well received by the crowd, as you can see... they were standing, not sitting... dancing, and clapping along. I enjoyed the show so much, I went back for another one of their shows on a different night... and was impressed to find that they didn't just do a carbon copy of their first show. They mixed it up with quite a few different songs, which requires extra work on their part, and shows that these guys were real pros. I mentioned that Jenene's performance spanned multiple musical genres. I got a good laugh at one ironic moment during her show. At one point, she snuck in an operatic song. This made me laugh, since one of the things I hated about our recent cruise on the MSC Seaside was that some of the entertainment in the evening was opera. But Jenene made it work, as just one song in a show that had a little bit of something for everyone. I enjoyed the show so much that I went back for another one of her shows a little later in the cruise. One of several things that seemed inferior about the entertainment on MSC Seaside during our January cruise was that they didn't bother to fly in professional stand-up comics like a lot of cruise ships do. Instead, they had a permanent cast of onboard comedians who did improv comedy rather than stand-up comedy. I suspect the reason MSC did this was that it was way cheaper to have a couple of young comedians permanently on the ship than it would be to fly in different stand-up comics for each cruise. I guess I would have been fine with that if the improv had been superior to the stand-up comedy I've seen on other cruises, but it simply wasn't. So, I was really glad to see that Norwegian had not tried to do comedy on the cheap on Norwegian Bliss, and I was delighted to see several really good comedy shows from several different stand-up comics during our cruise. 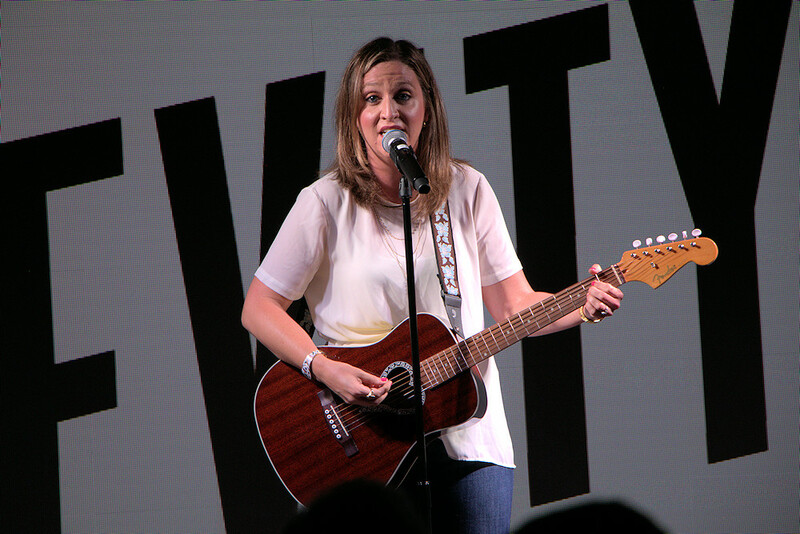 One of the comedians that really impressed me was Allison Weber, who was a very creative comic that integrated a lot of parodies of pop songs in to her act... something akin to what Weird Al does. 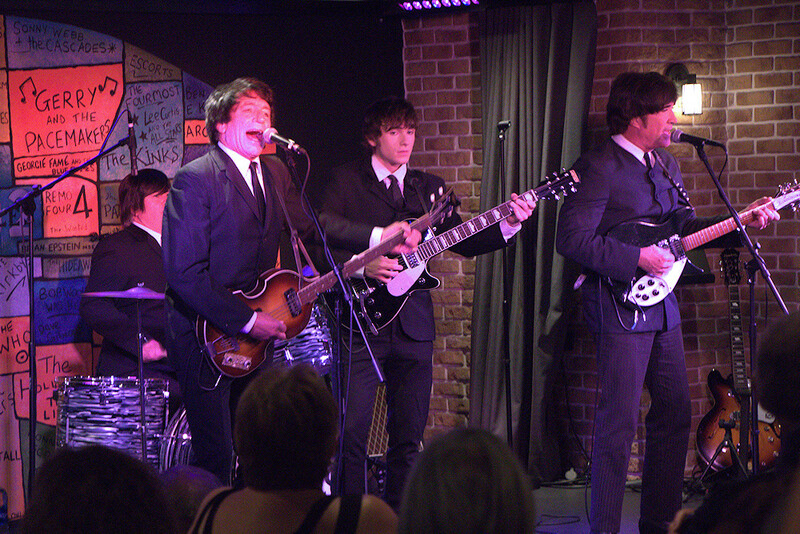 Before I move on from the subject of entertainment, I should also mention that the ship featured a Beatles tribute band that performed in a cruise ship version of the Cavern Club from Liverpool, England. Beatles fans will know what I'm talking about... and any twenty-somethings reading this will not have a clue! The highlight of the cruise was the day that the ship sailed through the Panama canal. Norwegian Bliss set a record that day... the largest cruise ship to ever sail through the Panama canal. There were literally people standing along side the canal who had just come to see the biggest cruise ship that's ever gone through it. I guess I should back up and say, for anyone that doesn't already know, that the Norwegian Bliss was brand new when we sailed on her. She had just sailed out of the ship yard after completing construction, done a transatlantic cruise to New York, and then sailed down the east coast to Miami, where we got onboard. The point of the whole cruise, from NCL's point of view, was to move their new ship over to the Pacific Ocean, where she would be based for the summer... doing Alaska cruises out of Seattle, Washington. Even though this was my 44th cruise, I had never done a Panama canal cruise before. I had really been waiting for them to complete the expansion of the canal, which had been going on since 2007, and which finally completed in 2016. I figured that once the canal expansion was completed, we would start to see some larger, more interesting cruise ships doing Panama canal cruises. Prior to 2016, the only cruise ships that could fit through the canal were smaller and not really state-of-the-art. I was glad I waited for the Norwegian Bliss to come along, because it was the perfect ship for the Panama Canal! 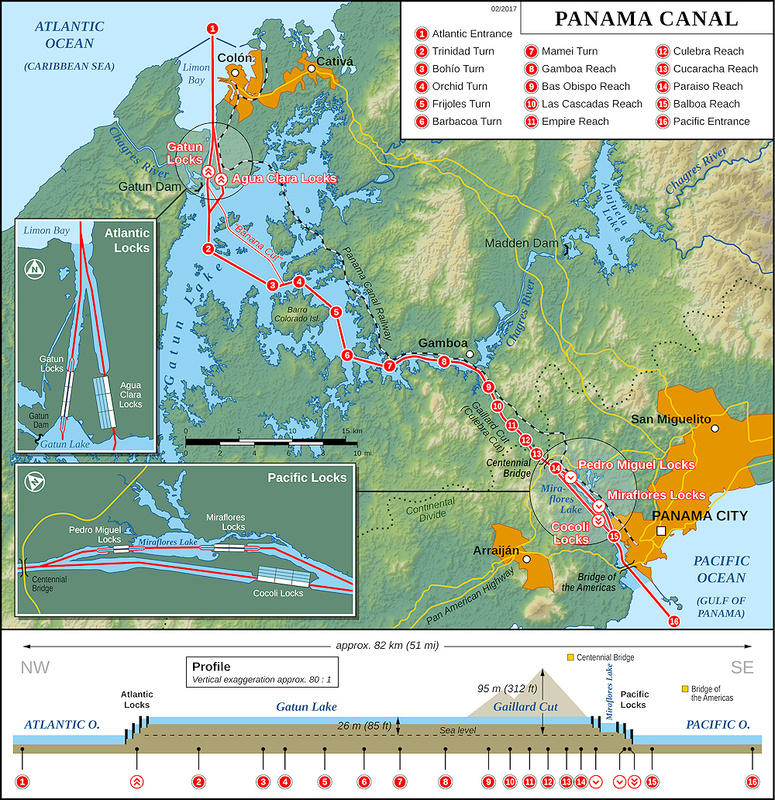 Prior to our cruise through the Panama canal, I had seen a lot of YouTube videos about the canal, and looked at several web sites with information about the canal. I felt I had a pretty good idea of what the canal was all about. Yet, when we actually went through the canal, there were several unexpected things that surprised me! 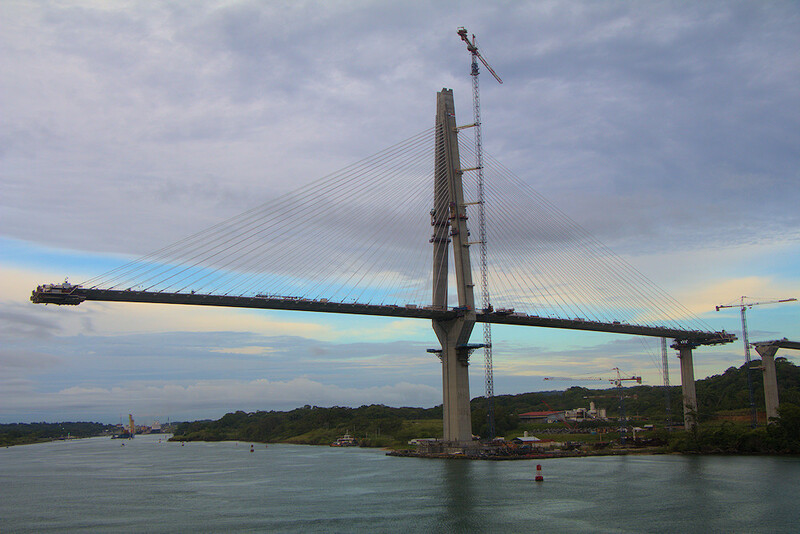 Seeing the new bridge under construction got me thinking about an issue that had not really occurred to me before about the Panama canal... it creates a obstacle to automobile transportation within Panama. Imagine how hard it would be to get from one side of the canal to the other, in a car, if there wasn't a bridge. So, I could definitely see why they would want to construct this big new bridge on the Caribbean side of the canal... and I wondered how they got along without it for so long up until this point. Ferries, I would guess. Once we got past that new bridge, we reached the split in the canal. 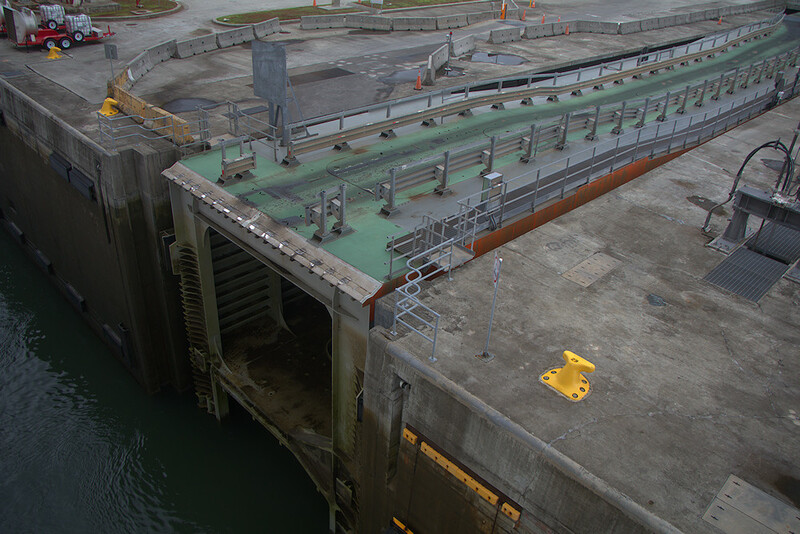 Ever since that canal expansion project completed, there have been two sets of locks... the original set of locks that have been there for over a hundred years, and a new, larger set of locks for the big ships that are too big to fit in the original locks. What you see in this next picture is the place where the smaller ships branch off to the right, and the larger ships go left to get to the new locks. 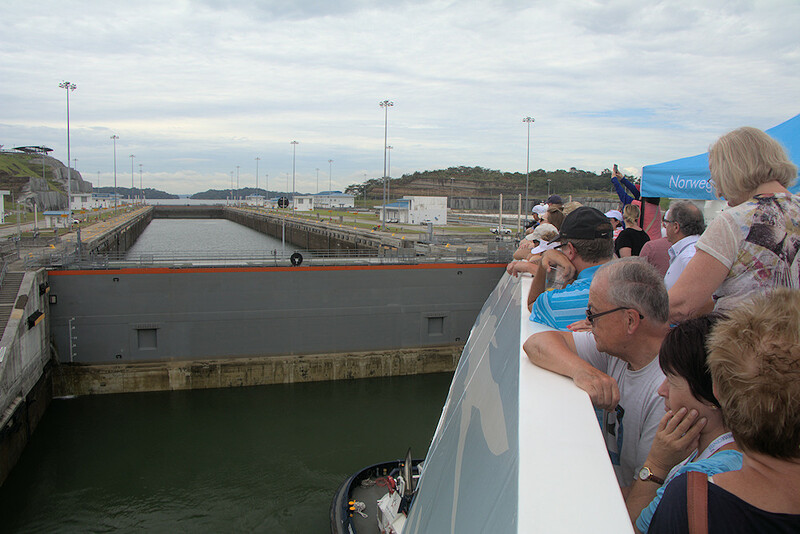 The next photo shows the view from the right side of our ship as we reached the first of the locks. The first gate had been slid open so we could enter the lock. Something else I didn't expect was that NCL would allow passengers to go to the crew-only area at the bow of the ship. A quirk of the unique design of the Norwegian Bliss is that there aren't any good places other than the observation lounge where you can get a good view of what's in front of the ship... unless you happen to be fortunate enough to be staying within The Haven, which takes up a good chunk of the real estate at the front of the ship. The observation lounge is big, but not big enough for 3800 passengers! So, it was very thoughtful of the ship's management to let the passengers have access to what is normally a crew-only area at the front of the ship. But it was way too crowded for me up there, so I only stayed long enough to snap a couple of photos. While I was up there with the big crowd at the front of the ship, I snapped this next photo as we sailed past the big control tower for the new set of locks. Those of you who have sailed through the original set of locks will notice that this tower does not look familiar! Before I left the bow of the ship, I turned the camera towards the ship's navigation bridge. I like the photo, because it makes me think about how exciting it must have been to be in the bridge when the ship was going through the canal. Here's a close-up view of one of the gates on the new side of the canal. On the old side of the canal, the gates are split in half, come out from both sides of the canal, and meet in the middle. On the new side of the canal, the gates are a one-piece design that just slide all the way across to seal it closed. Notice in that last photo how large that gate is! The thing on top of the gate is a roadway. You can see the rubber marks where vehicles have crossed it. With the new bridge not yet completed, vehicles currently get across the canal by driving over the top of the gates when they are closed. This was another thing that surprised me! You can see what I'm talking about in this next picture, which shows the gate closed and vehicles using it as a bridge across the canal. 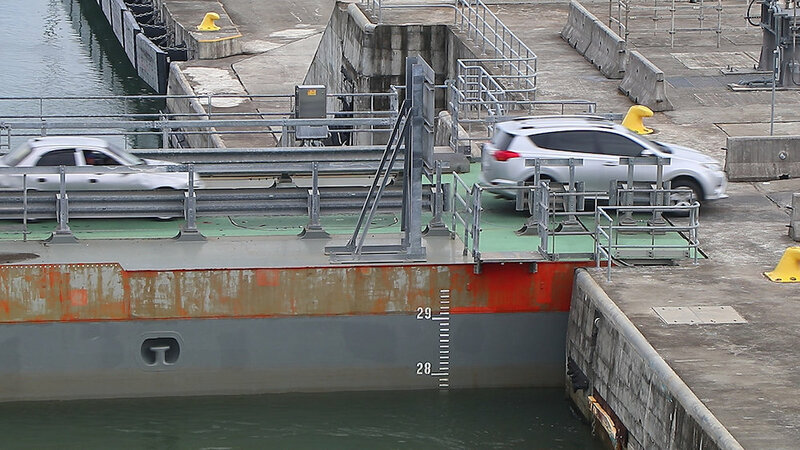 Another thing that really surprised me about the Panama canal was how long it took to get through it! We entered the Caribbean side of the canal at about 6 AM, and we didn't reach the Pacific until about 8 o'clock that night! Just getting through each lock of the canal took close to an hour... and there are three locks on the Caribbean side, plus three more on the Pacific side. 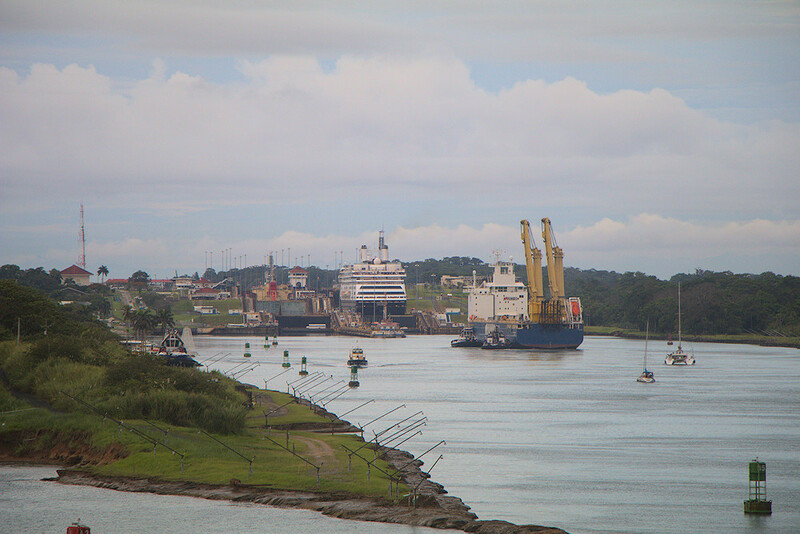 When they opened up the gate on the third lock on the Caribbean side, I snapped this next photo which shows you what's on the other side of the locks: Gatun lake. 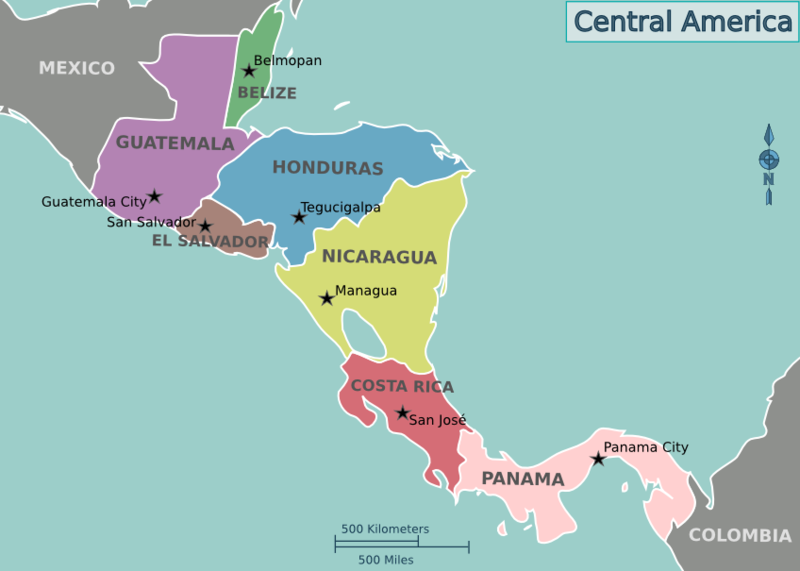 Perhaps this wider view of the geography of Central America will make the situation even more clear. 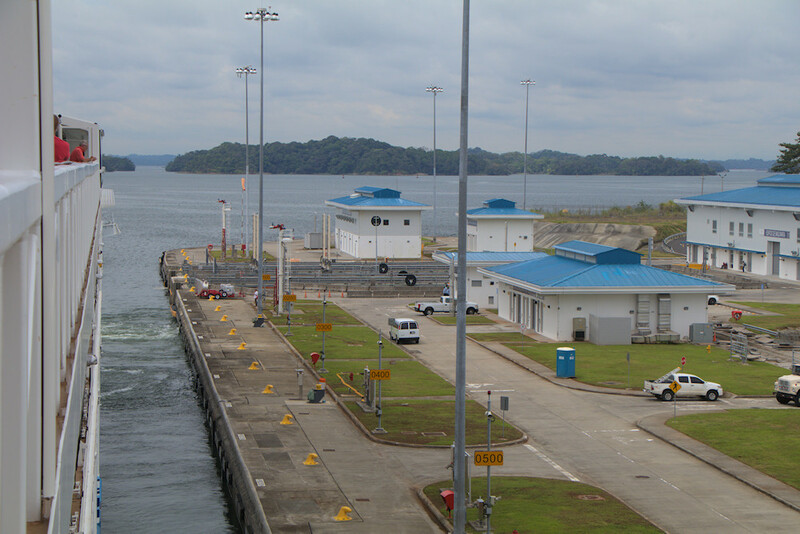 The isthmus of Panama actually runs east-west, so when you go through the canal from the Caribbean to the Pacific you are very definitely going north to south. I was not previously aware of that! While I'm sorry the three hour battery life of the GoPro prevented me from capturing every moment of our transit through the Panama canal, I'm happy overall with the way the time-lapse turned out. 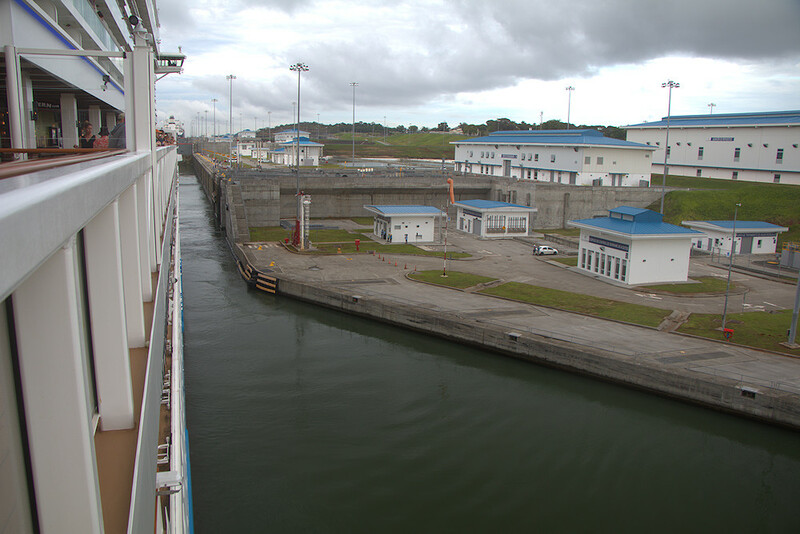 And maybe if I ever take another cruise through the Panama canal, I'll get another shot at making one continuous time lapse of the whole thing! Making a time-lapse video with a GoPro Hero 6 is actually really easy, and I think the results speak for themselves. One key to a good time-lapse is positioning the camera somewhere very stable, where it won't move. I like to use 3M command strips to attach my GoPro to things, because those command strips are rock solid, yet can be easily removed when you're all done, without damaging whatever you attached the camera to. 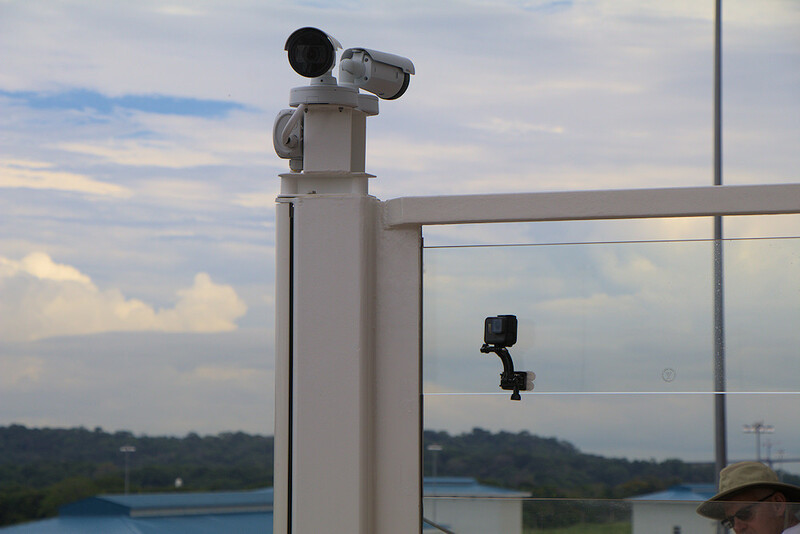 For my Panama canal time-lapse, I simply used command strips to attach the GoPro to a piece of glass along the side of the ship. Here's a wide shot, that shows the thing I attached the GoPro to... which, ironically, also had two security cameras mounted on it. That structure was simply a little wind-break along the Waterfront, not far from the Mojito Bar. I picked that particular spot for my GoPro because I wanted to stay close to it all day... and there was some nice seating in the shade not too far away, the Mojito bar was nearby if I got thirsty, and the men's room was fairly close, too. It wasn't the most perfect spot to place the camera for a time-lapse of the canal, but it was the most perfect spot that I had access to! The ultimate location to shoot a time-lapse of the canal would have been from one of those forward-facing bar stools on the sun deck of The Haven... but that was not financially possible this time through. Maybe next time? We enjoyed the Norwegian Bliss so much that we could have easily spent 15 days aboard without ever getting off the ship. The fact that we actually stopped at a few ports along the way was just a nice bonus! Here's a look at what we did in the various ports of call. Our favorite shore excursion of this entire cruise was in Puerto Vallarta, where we took an excursion to Las Caletas beach, which is a private beach accessible only by boat. Vallarta Adventures owns the property, and has been developing a fantastic little place for tourists to visit. We first discovered it on a Carnival cruise several years ago, and were eager to go back. Much to our delight, Vallarta Adventures has continued to invest money in further developing the property since our last visit, and it was even more fantastic this time around. We were happy with it when it was just a secluded private beach with lots of hammocks and loungers, a nice restaurant, plenty of bathrooms, and a bunch of domesticated macaws who were often allowed to free-fly over the beach to the delight of the tourists. That's Kellyn in the previous photo, having some one-on-one time with one of them. A funny thing about that encounter with the sea lion is that it was totally random. They never announced it was going to happen, I just happened to be on the beach with my camera when they showed up in a small boat with the sea lion, and had him jump in the water for a frolic with the tourists. To have something so spectacular happen unexpectedly like that... it was simply a moment of sheer vacation joy for me. I totally loved it, and can't wait to go back to Las Caletas beach again some day. And Kellyn was super happy because she got to see macaws flying around the beach, and even got to have that one on her shoulder for a while. 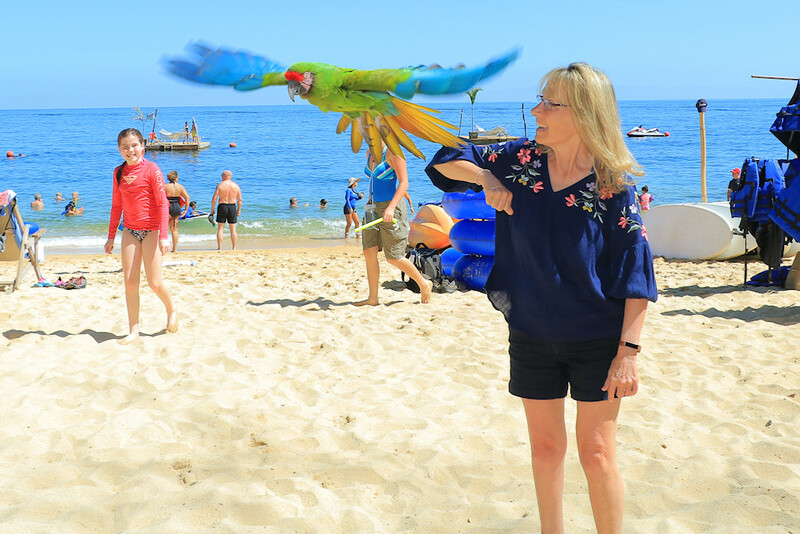 Puerto Vallarta wasn't the only place we ran in to free-flying macaws, either. I knew that Central and South America was known for macaws, so I was really hoping we would encounter some during our Panama canal cruise... and we actually ended up seeing macaws in three different ports of call. 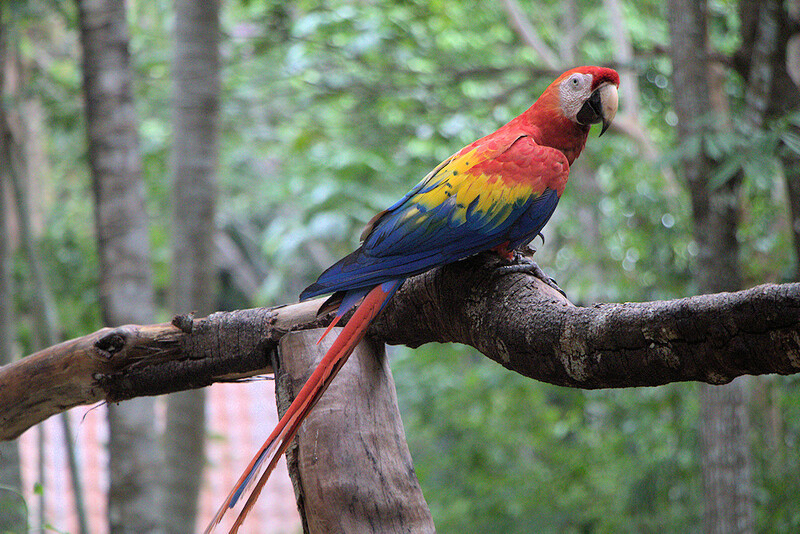 Besides Las Caletas beach in Puerto Vallarta, we also saw one just sitting among some shrubbery along the side of the road in Cartagena, Columbia... and then our best macaw encounter was in Costa Rica, where we took a shore excursion to a macaw sanctuary. Most of the macaws in the sanctuary were in big aviaries, because they were either being rehabilitated for later release back to the wild, or they had some permanent disability that would prevent them from ever surviving in the wild again. 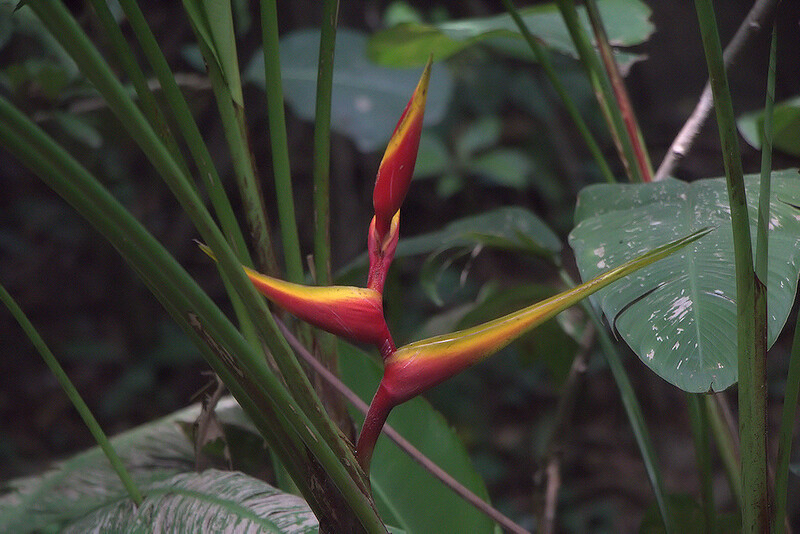 And it was very cool to see all the beautiful macaws in the big aviaries, for sure. But the coolest sight at the sanctuary was to see that quite a few of the macaws who had been rehabilitated there and then released were content to just stick around on the grounds of the sanctuary and live their lives in the company of their friends who were confined inside the aviaries. Macaws are very social in that way. We got a real kick out of seeing the macaws who were outside the aviaries, just enjoying life as free birds, but content to stick around the sanctuary grounds. 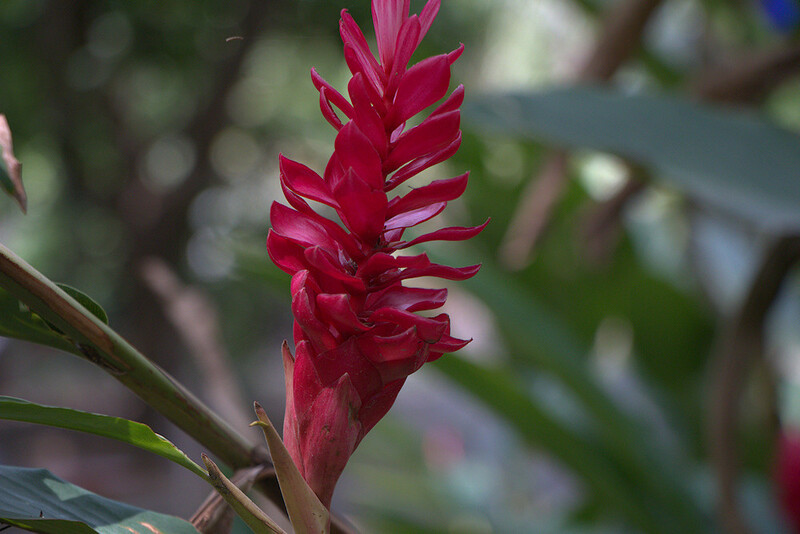 The macaw sanctuary was literally located in the jungle of Costa Rica, and they had a lot of very beautiful plants growing on their property... thanks to the abundant rainfall. And luckily for us, the weather was perfect the day we visited. The original itinerary for our cruise on Norwegian Bliss had us scheduled to stop in the Mexican port city of Manzanillo. However, once we actually got onboard the ship in Miami, we were informed that there had been an itinerary change... and that Manzanillo was out, and we would be stopping in Mazatlan instead. I've been to both places before during "Mexican Riviera" cruises out of Los Angeles, and I'm really not a big fan of either Manzanillo or Mazatlan. So, it made no difference to me. We would just stay aboard the ship that day. We had a nice day aboard the ship while most of the other passengers went out on shore excursions in Mazatlan, and that's pretty much all there is to say about our day in Mazatlan. 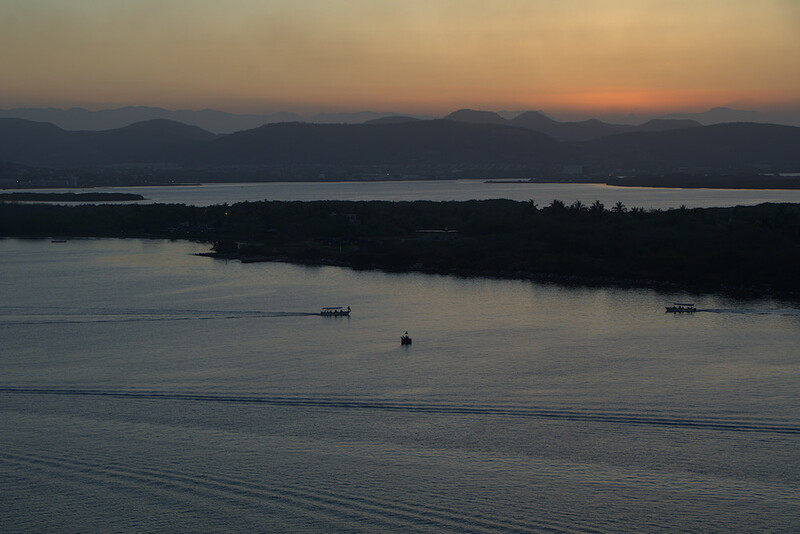 But I've got quite the story to tell about what happened in one of our other ports of call! We had booked a shore excursion to a beach resort in the city of Monterrico, a 20 mile bus ride down the coast. I actually looked it up on Google Maps before we left the ship, just to assure myself that we weren't going to have to do some horrendously long bus ride. Google maps said the 20 mile ride would take 55 minutes. I figured it must not have been a very good road. Much to my surprise, when our bus drove away from the cruise terminal in Puerto Quetzal, it did not head down the coast... it headed inland. This should have raised a red flag in my mind, and in retrospect I should have just checked with the tour guide to see what that was all about. I figured that the road along the coast must have been too nasty for a big bus, and that our driver knew some much better route to Monterrico via inland roads. It never occurred to me that our bus driver might be an idiot. I figured he was a professional bus driver... he must know where he was going. He didn't! I didn't know it at the time, but found out what I'm about to tell you later that day... as our bus full of tourists tried to figure how the heck we had gotten so very lost in Guatemala! It turns out that Guatemala is a pretty big country, and the bus driver was actually from the complete other side of the country. It's somewhat analogous to a bus driver from New York City getting hired to do a special job in Florida. He had no clue about the roads in the southern part of Guatemala... so he made a very critical mistake. He used an app on his smart phone to tell him how to get from Puerto Quetzal to Monterrico. Now allow me to show you a map of the area where I have traced out two routes. In green, the route the bus should have taken to get from Puerto Quetzal to Monterrico... a 20 mile straight-shot down the coast. In red, you see the route our bus actually took, thanks to the app on the bus driver's phone. We got an interesting view of the interior of Guatemala that day from the windows of our bus! I could even see several of Guatemala's famous (dormant) volcanoes. This map doesn't show enough detail for you to see what happened when we reached the end of that red route. We had been in that bus for an hour and a half already when we reached the little town of La Avellana... which is located at the northern end of the Chiquimulilla Canal. The road runs out when you get to La Avellana, and reach the canal. If you want to take a car from La Avellana to Monterrico, you have to drive your vehicle on to a little wooden ferry, which will take you down the canal to Monterrico. Here's a photo from the Internet, showing you the ferries at the canal. They are each barely large enough to ferry a couple of small cars. We were in a gigantic tour bus! When we reached the canal, and I saw them putting cars on to the rickety little ferries, I was slowly starting to figure out that our driver had screwed up... but it hadn't fully dawned on me at that point, so I didn't reach for my camera to get a photo of my own. That's why I had to use that little photo from the Internet. But really, if you imagine a small car going down those wooden planks on the lower right side of the photo, and on to one of those ferries... you are getting a pretty good mental picture of what I saw out the window of our tour bus. Our driver got out of the bus, talked to one of the locals, and then got on his cell phone and made a call to someone, presumably his boss or head office. I could tell from his body language it wasn't a good call. I was starting to put the pieces of the puzzle together in my mind, but still hadn't completely realized that our visit to the beach resort was not going to happen. And I still didn't think to get my camera out and get a photo of those rickety little ferries taking small cars down the river! When the driver got back in the bus, he turned it around and started driving it back in the direction we had just come from. He eventually told the tour guide what the situation was, and the tour guide eventually told us. They decided to stop at a little hole-in-the-wall market along the side of the road and buy us all beers or Cokes. That was a good move, as it was a nice "I'm sorry for being the worst bus driver in the world" gesture. They also let us know that we would not be attempting to get to the beach resort at this point, and that we would instead proceed directly back to the ship. And I'm pretty sure that the entire bus load of people was glad to hear that news at that point! 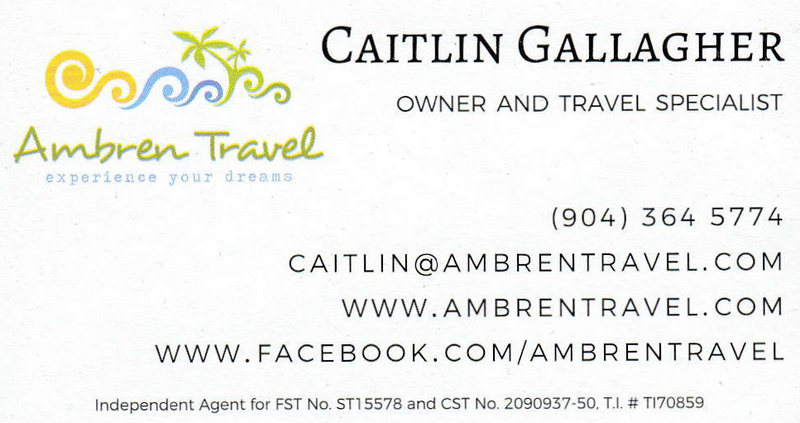 One of the passengers on the bus with us happened to be a travel agent, and he not only had service on his smart phone, but he knew the email addresses of several officers on the ship. So he fired off an email to the ship, and let them know that our beach resort shore excursion had gone bust. By the time we got back to the ship, the shore excursion staff had the names of all the passengers on the bus, and had issued full refunds for the cost of the excursion. You might think that that's the end of the story right there... but wait, there's more! About two weeks after that day we were lost in the interior of Guatemala, one of Guatemala's volcanoes erupted... covering the surrounding countryside in hot ash, and killing about a hundred people. It was a pretty big news story... and when I first heard about it, I thought to myself "Guatemala... wasn't that where we got lost on that tour bus?" So I went to Google maps again and studied the map of Guatemala... comparing the route our bus driver took through the interior of Guatemala with the location of the Fuego volcano that had erupted there. Guatemala is a big country, and has a lot of volcanoes, so I figured it was likely that the Fuego volcano was a few hundred miles away from the part of the country we had been in. I was shocked when I located the Fuego volcano on the map! So, the red route is the route our bus actually took in a futile attempt to get to Monterrico. 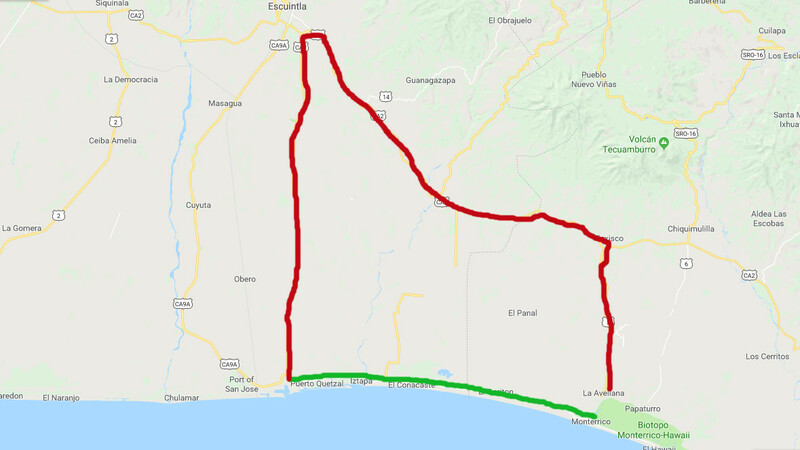 Notice on that red route, we travelled north to the town of Escuintla, before switching to a different highway and heading southeast. Using Google maps, I located the Fuego volcano and measured the distance from it to that northern most part of our actual bus route. I was shocked to find that, two weeks before the volcano erupted and killed 100 people, we were on a bus just 15 miles from the volcano. I had actually seen the Fuego volcano out the window of the bus that day... completely unaware of what would happen two weeks later! How's that for a story?!?! 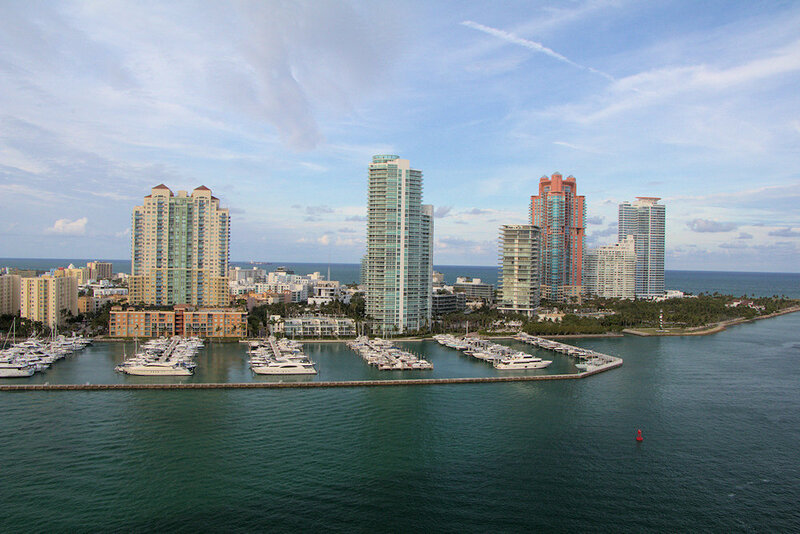 Sailing out of the port of Miami is one of the most beautiful sailaways you'll ever experience on a cruise ship. Here are a few photos I snapped as Norwegian Bliss began her cruise. As we were sailing out the port of Miami, I got my first look at the new terminal that Royal Caribbean is having built for them. This will be known as terminal A at the port of Miami, and should be completed in the Fall of 2018. It will be the home for two of the biggest cruise ships in the world: Symphony Of The Seas and Allure Of The Seas. Not to be outdone, Norwegian Cruise Line is also having a brand new terminal built. In fact, it will be right next door to Royal Caribbean's, at terminal B. There's an interesting article by the Los Angeles Times about the two new terminals. Read it here. In some ways, I was a bit disappointed in the Internet situation on Norwegian Bliss... because it was quite pricey, and also because they blocked access to YouTube on all but their most expensive Internet access plan. Being able to have access to YouTube is an absolute must for me, if for no other reason than I have to be able to monitor the comments on my YouTube videos so that I can delete anything offensive or inappropriate. Also, I didn't really want to go 15 days without uploading a single cruise video to YouTube. So, I basically had to buy their most expensive Internet plan. Since this was a 15-day cruise, not just a 7-day cruise, the Internet access plans seemed especially expensive. Here is the price list. Before you freak out at the prices, just remember that if you're trying to figure out what Internet access will cost you on a 7-day cruise, divide the numbers you see here by two. 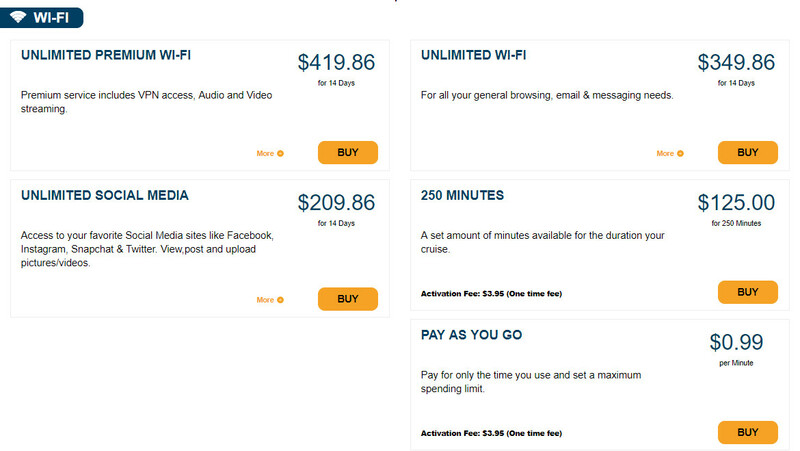 I think most people would be just fine with the "unlimited social media" plan, which for a 7-day cruise would be $105. That still seems pricey to me, but not as bad as the $420 I had to pay to have access to YouTube. Given the importance of the Internet in today's society, I really think that NCL is making a mistake by pricing their Internet service so high. It's going to offend a lot of people, and only further the reputation that NCL has for nickel and diming passengers. But the good news about Internet access on Norwegian Bliss is that the "Unlimited Premium WiFi" plan that I bought was absolutely amazing. It was so good that I had to go down and talk to one of the Internet experts to find out why it was so good. I knew that Royal Caribbean has an exclusive deal with O3B networks for use of O3B's advanced network of low-orbit satellites... therefore Norwegian Bliss was not using O3B. Royal Caribbean has a lock on that. Plus, I did a ping test on Norwegian Bliss and the ping time was still fairly high, not low like it is when I've tried it on Royal Caribbean and the O3B network. So Norwegian Bliss was clearly not using the O3B network. But I was able to upload gigantic video files to YouTube in just a matter of minutes... way faster than it would work at home, on my cable modem. So, some very cool technology was clearly in play here. Like I said, I went downstairs to talk to the Internet experts on Norwegian Bliss... to find out what technology they were using to get such blazingly fast upload speeds from a cruise ship. His answer really surprised me. He said they had the exclusive use of an entire satellite. In other words, Norwegian Bliss had access to a satellite all its own... not shared with any other users on land or at see. A dedicated satellite! Plus, he said, they were using all sorts of optimization technology. After speaking to him about that, I also started thinking that the high price of the "Unlimited Premium WiFi" plan probably also contributed to the speeds I was getting. It was priced so high, that probably very few passengers had bought it. The people who bought the lower priced plans all had their speeds throttled and web site access restricted. The few folks like me that forked over the big bucks for the "Unlimited Premium WiFi" plan did not. It was kind of like being on a 4 lane freeway and almost everyone else was restricted to the three right lanes, and me and just a couple of other cars had access to the left lane and no speed limits. So, while I didn't appreciate having to pay $420 (on top of my already substantial cruise fare) just to be able to upload videos to YouTube, I sure did appreciate that once I paid all that money, I had an Internet fast lane. It was the fastest upload speeds I had ever experienced from a cruise ship. 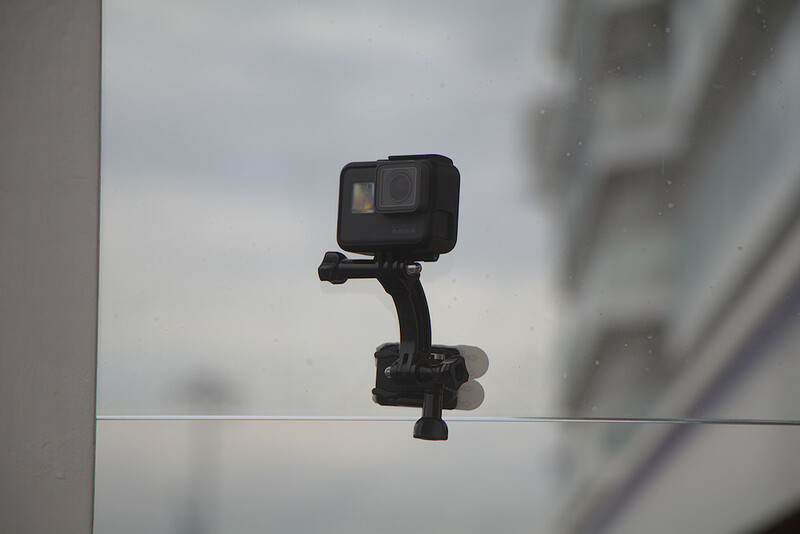 While I was onboard, I uploaded a LOT of YouTube videos about all the cool things I was experiencing on the Norwegian Bliss. 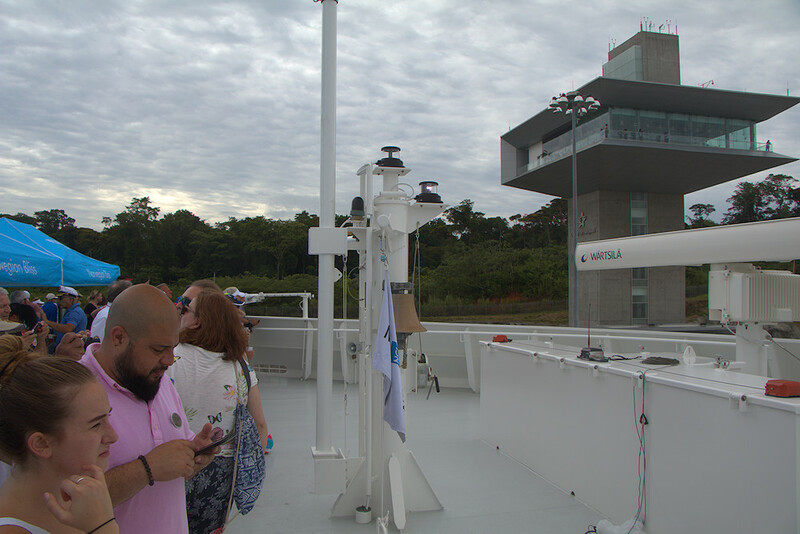 I uploaded videos about the observation lounge, the water slides, the go-kart racetrack, our journey through the Panama canal, and several others. This did not go un-noticed by the folks at NCL. Apparently the folks in their social media department noticed the stuff I had posted to a Facebook group about the Norwegian Bliss and the videos I had posted to YouTube. They were very appreciative of all the great free publicity I was generating for their new ship. So, they started sending small thank you gifts to our cabin. 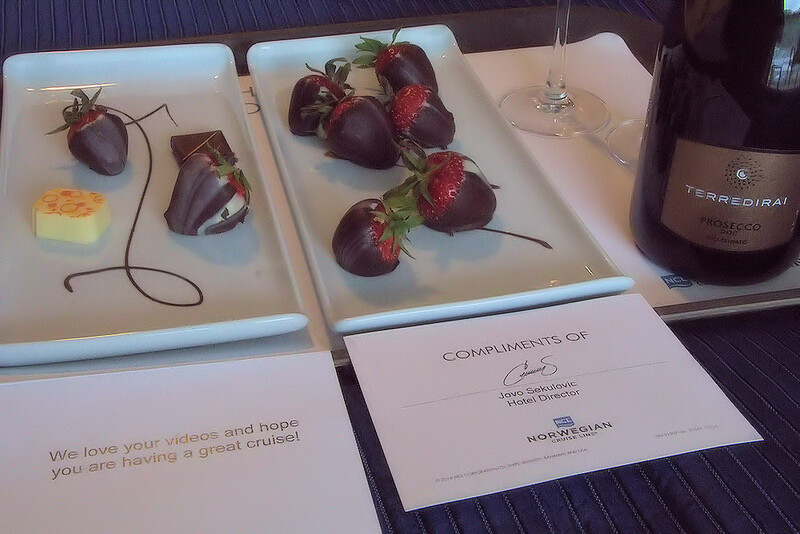 During the course of the cruise, I think there were three bottles of champagne delivered to the cabin! The first two times it happened, we took the champagne up to the observation lounge, asked the bar staff for champagne glasses, and sat around and drank champagne like we were big shots. It was fun. By the time the third bottle arrived, I was pretty much over champagne... and we ended up leaving that bottle in the cabin at the end of the cruise. I wonder if our cabin steward got to enjoy it, or did he simply return it to wherever it came from? 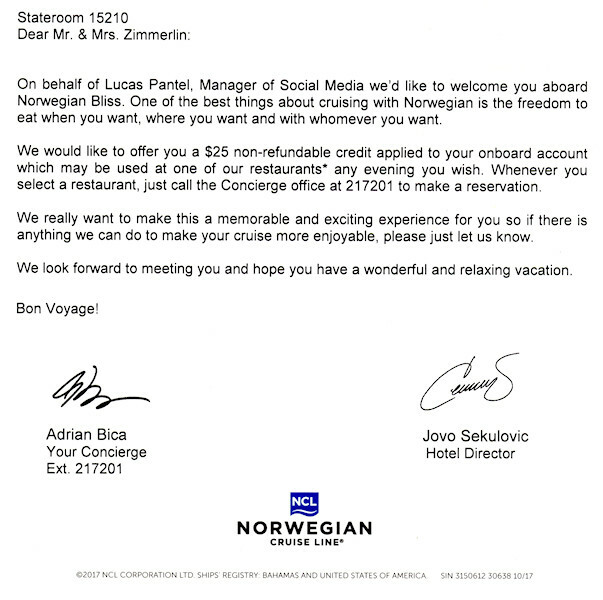 The key phrase in that letter was to "just call the concierge office" to make a reservation. 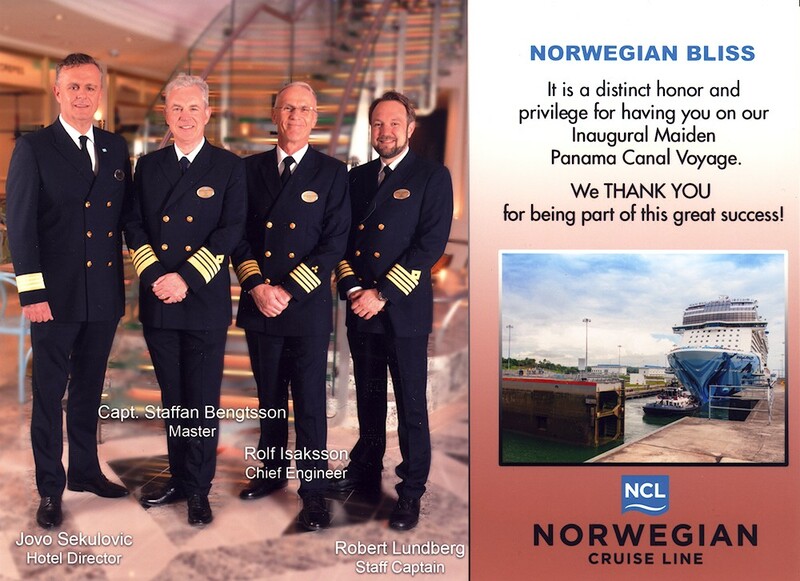 I knew, from having sailed in The Haven on several other NCL ships, that there is only one concierge onboard... the Haven concierge. And the Haven concierge can get you a reservation to any restaurant, on any night, regardless of whether that restaurant is already fully booked up or not. It's one of the greatest perks of staying in The Haven. So, this letter they sent was my golden ticket to a reservation at Cagney's. And on top of that, a $25 discount, too! The perks of being a big deal on YouTube!!! I really wanted to cruise in The Haven on Norwegian Bliss, but it was just too pricey since it was a 15-day cruise. 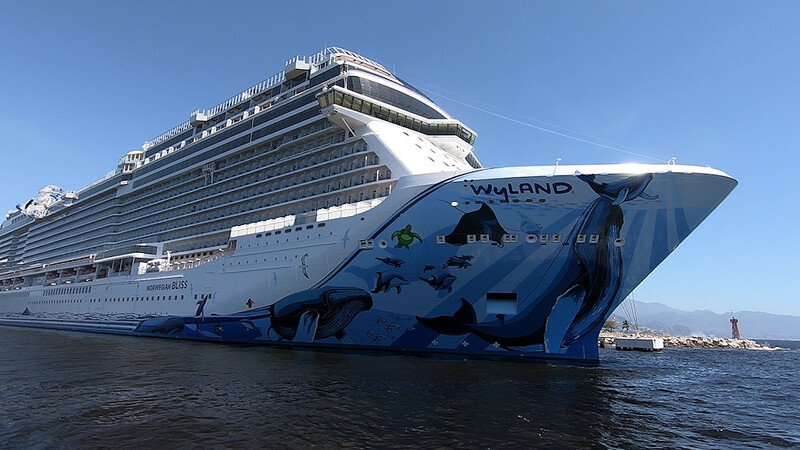 Plus, NCL was able to get even higher prices than normal for this ship, since it's the newest in the fleet and the one everyone wants to go on. That's supply and demand in action. Fair enough. I'm a capitalist, so I accept that. But still, I have to admit, I was a bit disappointed at not being in The Haven this time around. My last four NCL cruises had been in The Haven, and my next two were going to be. But I just couldn't afford it for Norwegian Bliss. It's a Haven bath robe! They sent two of them to our cabin, plus one to my sister down the hall! 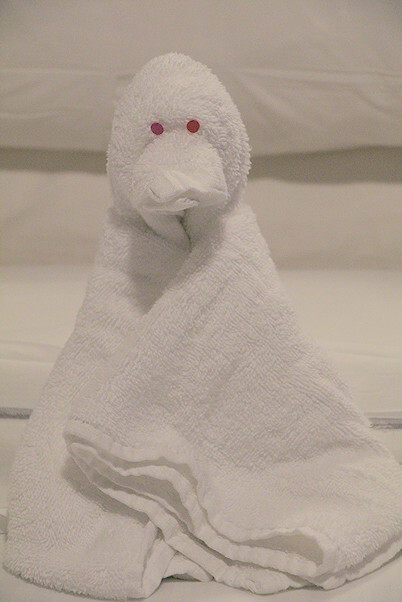 We really enjoyed having them since we had access to the thermal suite in the spa during the cruise. 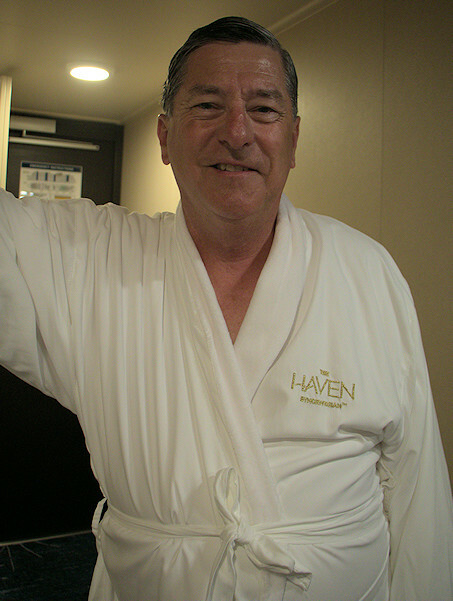 It was nice to just change in to swimsuits in our cabins, and then throw on the Haven bathrobe for the walk from our cabin up to the spa. The dinner at Cagney's was the best gift, but the Haven bath robe was a very close second! And I really appreciated the nice treatment from NCL. I still would have given them all the free publicity even if they hadn't done all that... because I was really impressed with the ship... but it was really nice that they showed such appreciation for all that great free publicity they got. Don't Yell "Code Bravo" in a Theater! Towards the beginning of the cruise, there was actually a small incident. A "code bravo"... which is cruise ship code for a fire. They had to have the ship's emergency fire team respond to it. My wife and I were having a drink at the bar in the Observation Lounge when the first "code bravo" announcement was made. They use that term, rather than announcing that there is a fire, so that they don't panic the passengers. I've been on enough cruises that I knew exactly what a code bravo was as soon as they made the announcement. The bartender heard me talking to my wife about the code bravo announcement, and offered his opinion that it was almost certainly nothing to worry about since the announcement had specifically said that the incident was in the incinerator room. I learned later that these type of situations are common in the incinerator rooms of all kinds of ships, and that the incinerator rooms are designed specifically to contain a fire that might occur. But I also had a little bit of skepticism in my mind. I knew that there were crew members on the Costa Concordia who tried to calm passengers by telling them that there was absolutely nothing to be concerned about when that infamous incident first occurred. So, I decided to do just a little bit of investigation of my own to make sure that this wasn't the start of a bad fire on Norwegian Bliss. Plus, I'm a YouTuber now... so if there was some kind of fire, I wanted to at least get some video of smoke rising out of the ship somewhere. I finished my drink and headed to our cabin to get my camera. Then I went up to the highest view point on the ship to look to see if there was any smoke coming out of anywhere. There was not. I wasn't really surprised. I didn't really think I was about to witness some big incident on Norwegian Bliss, but I wanted to have my camera with me just in case I was wrong. I stood out there watching for any signs of smoke for a few minutes, and then I was confident that the code bravo announcement was no big deal. Something similar to the time at the nuclear power plant where I work when a spark from welding started to ignite a little piece of something next to the welder, and I grabbed a fire extinguisher and shot it off, to make sure that no fire ever got started. Technically, I guess you could call it a fire, but not really. Whatever happened in the incinerator room on Norwegian Bliss was probably some minor thing like that. I posted the video to YouTube just because I was impressed with the professionalism of the Captain for fully explaining the incident to the passengers... and also because I thought it was noteworthy that there had been an incident requiring an emergency response on Norwegian's brand-new ship... even if the incident was basically nothing to be concerned about. Later in the cruise, when NCL was sending me champagne and Haven bath robes and sending me to Cagney's for dinner... I felt kind of bad that I had posted that video about the code bravo to YouTube. I hope it did not cause NCL any embarrassment. I really do think the Captain did a nice job in fully explaining the situation to the passengers. In this section, I'm just going to include a few photos/videos that didn't seem to fit in anywhere else in this story up until now. 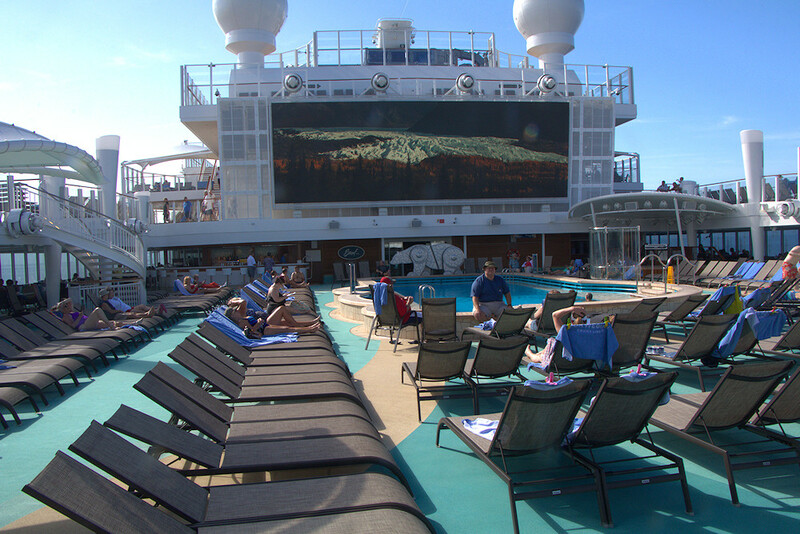 For example, this photo of the unusually wide video screen they have out by the main swimming pool on deck 16. That's a very unusual aspect ratio for the screen. Most HD video content is produced in a 16x9 aspect ratio these days... but that screen is hugely wider than that. They even had some scenic Alaska videos that had been produced for a very wide format screen like that. The downside to having such a wide format screen like that is that if they decided to show a movie or TV show, they had to letterbox it. So, there wasn't a whole lot of content they could run on it in full wide screen format, and all the rest got letterboxed. It seemed like an unusual design decision to me. Why not just install a much taller 16x9 screen that would perfectly fit most of the world's HD video and movie content? Silas did a good job as Cruise Director, and it was easy to see why NCL gave him the plum assignment of CD on their new flagship. I've actually seen a few bizarre choices for Cruise Director on some of my previous NCL cruises, so it was good to see that they got it right on Norwegian Bliss. The only strange thing I noticed about Silas is that he never used his last name. 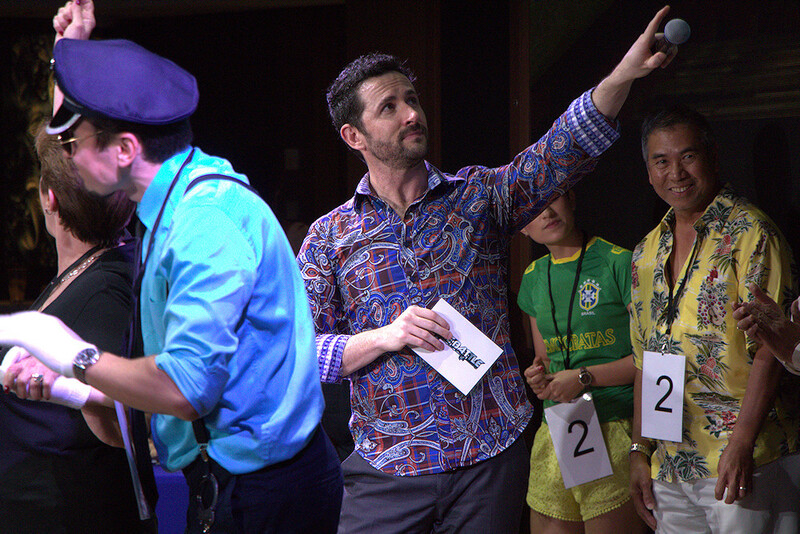 He was always referred to as "Cruise Director, Silas" or "Silas, your Cruise Director"... never as Silas Cook. That seemed odd to me, since Cook is such a straight-forward last name. I could see just going with your first name if your last name was Smolinski or Ruotsalainen... but Cook?!?! If you look at the photo carefully, you'll see it's actually a crappy photo! I shot it with my GoPro. Because of the design of the GoPro, when you go to push the trigger with your finger, it's easy to shake the camera a bit... which was just enough motion to blur the photo. I wish I had shot the photo with my big Canon DSLR camera instead! To recap some of the very positive things about Norwegian Bliss, here's what I loved about the ship. Two very fun waterslides... one that's gentle, and one that will scare the heck out of you!